Wonder 7-day January 20, 2019 - Southern Caribbean Fun! 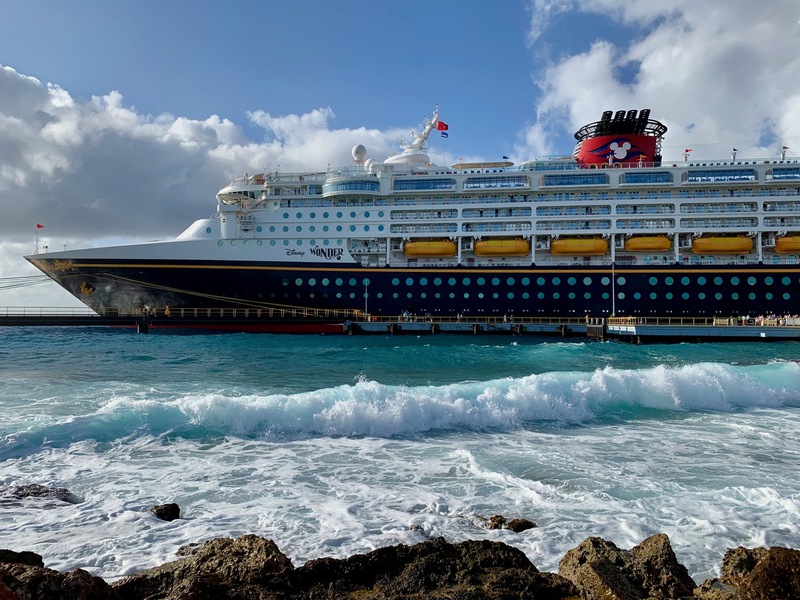 Discussion in 'Disney Cruise Line Trip Reports' started by anricat, Jan 28, 2019. This time we are off to San Juan Puerto Rico to spent two nights before embarking on the Disney Wonder for our 6th Disney Cruise, a 7-night Southern Caribbean adventure with ports of call in Tortola, St. Kitts, Curacao, and Aruba as well as two days at sea. Our travel day started very early, with a 3 AM alarm. Unfortunately, both Roger and I had some problems sleeping so I think I had an hour of sleep and he had about 30 minutes. Our pre-scheduled Lyft arrived right on time at 4 AM and we had no issues at the airport with security or check-in. The flight to Miami was uneventful. We all dozed a bit, then in Miami grabbed some food before boarding our connecting flight to San Juan. Once we landed in San Juan, we grabbed our baggage (which was pretty slow) and caught the shuttle to the car rental place where I ended up having to pay more money than I budgeted for because they required that I purchase insurance (since apparently my auto insurance doesn't cover Puerto Rico). Then they sold me the pre-paid tolls for $7/day. On the way to our accommodations, we stopped by a grocery store to pick up a few things for breakfast the next two mornings. After some confusion with the parking, we finally settled into our AirBnB apartment. We were pretty tired and hungry so we went for some dinner at a restaurant a couple of blocks away. The meal was good but not amazing. I tried some mofongo (a local dish made with mashed savory plantains) and while I liked the flavor of my dish, it wasn't particularly hot. After dinner, we returned to our apartment and fell into bed so that we would be ready for a full day of sightseeing the next day. Following along! I hope to go on this itinerary someday! We woke early, having gone to bed early the night before. But we felt refreshed and ready to take on San Juan. I think Emmaline slept 11 hours and Roger and I slept 10 hours. 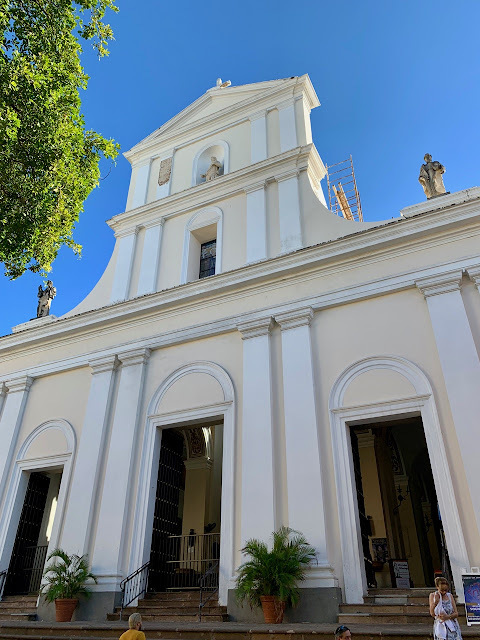 The plan for the day was to go to Old San Juan in the morning and then the rainforest in the afternoon. The festival of San Sebastian was going on in the old town and really caused some hiccups in my planning. We ate breakfast in our apartment and headed out to Old San Juan, arriving there at around 8:30 AM. We found a parking spot in a garage that was already almost full! From there, we walked through the town using a self-guided walking tour graciously provided by our AirBnB host. 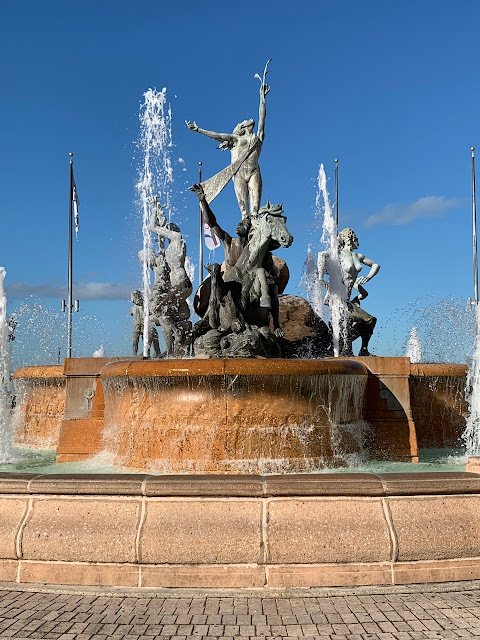 We saw a number of sites including the impressive Raíces Fountain, which represents the mixed heritage of the city. 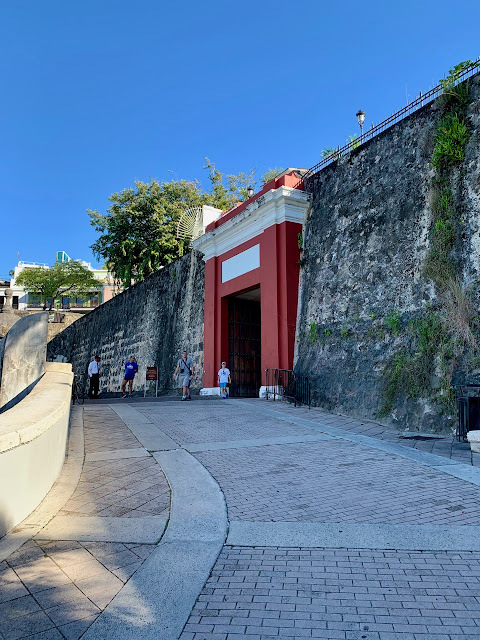 We walked along the outside of the original city wall before entering into the city via the only remaining door in in the wall (Puerta de San Juan) and seeing sites around the area such as San Juan Bautista Cathedral (second oldest in the Americas) and La Fortaleza (originally a 16th century fortification, now the governor's mansion). 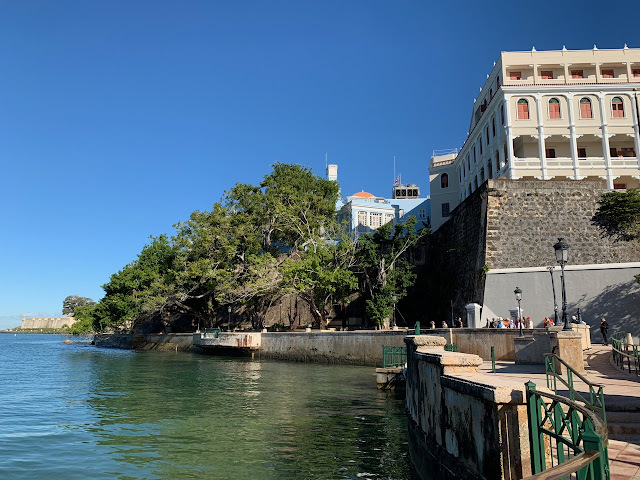 I really enjoyed our walking tour and next time would really like to go inside the Castillo del Morro fort. We didn't have time as the old town was already getting very busy with people pouring in for the festival. Plus, we were getting hungry. Even though it was only 10:30, because we had gotten up and eaten breakfast so early, we were ready for some brunch. 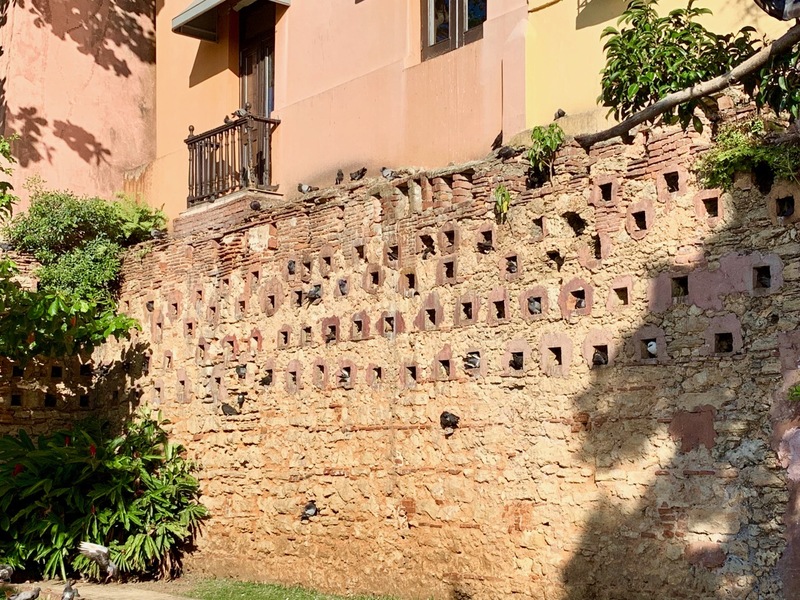 We had found several places that looked promising for brunch but because so many people were in the city, every place we tried was absolutely insane. We finally found a little bakery near the parking garage and we grabbed a couple of little things to hold us over until lunch. 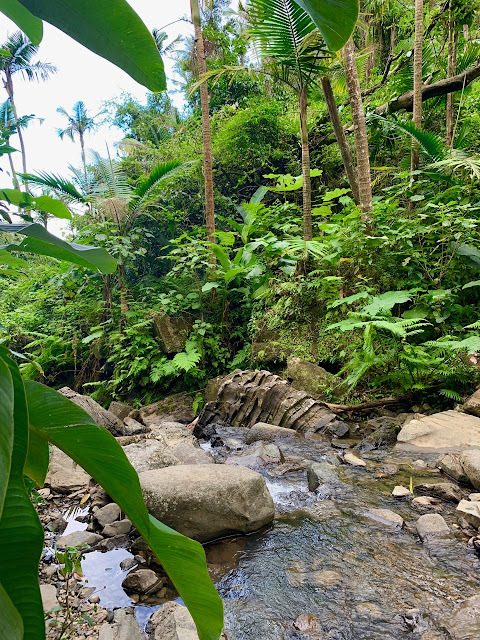 Then we retrieved the car and headed out of the city towards the rainforest, getting stuck in a really bad traffic jam on the way out that was caused by traffic trying to find places to park for the festival. 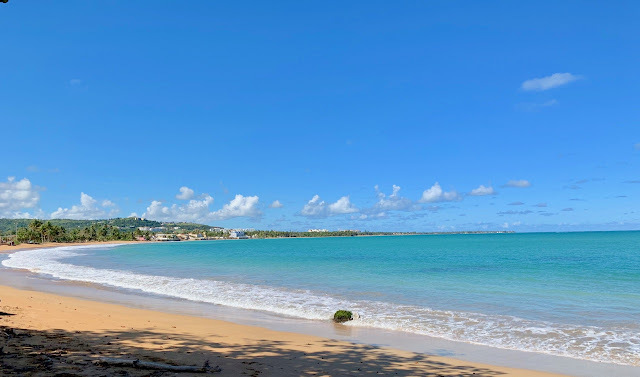 Not too far from the entrance to the rainforest, we stopped for lunch around noon at some food kiosks nestled against a pretty little empty beach (Luquillo Beach Kioskos). 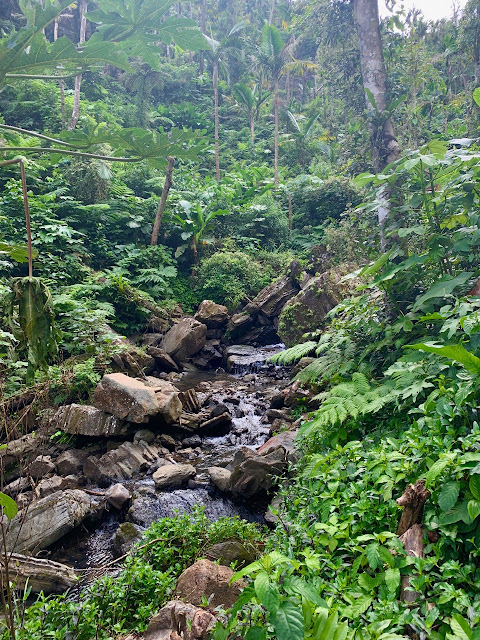 There were a lot of choices, but Emmaline lobbied hard for the pizza kiosk so we ate what turned out to be some really good pizza slices before making our way over to En Yunque National Forest. Unfortunately, because the government shutdown, the visitor's center was closed, but there were some really helpful park rangers outside providing information and handing out maps of the parts of the forest that were open. 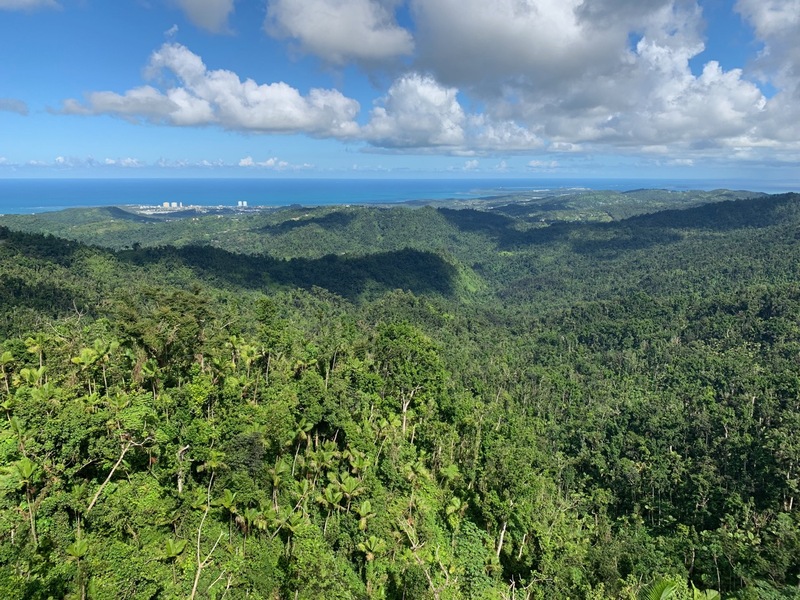 Regrettably, many parts of El Yunque are still closed as a result of hurricane debris and damage. Looking at the map and comparing it to the notes I had made during my research, we made a plan of places we wanted to stop. First up, we visited La Coca Falls, which is right on the roadway and was a pretty little waterfall. After the falls, we made our way to Yokahu observation tower, which was a bit of a climb to get to the top, but definitely worth the amazing views. There were also some bathrooms and a smoothie truck there. From there, we drove up to Juan Diego Creek and hiked a short way to a little pool with a small waterfall where people were wading or swimming in the cold water. On the way back, we stopped at an observation point (Las Cabezas Observation Point) that we had spotted on the way in and enjoyed the view. The forest was so beautiful and I'm really glad we made the drive over there (made 45 minutes each way). We definitely could have spent more time there, even with many parts of the forest being closed. 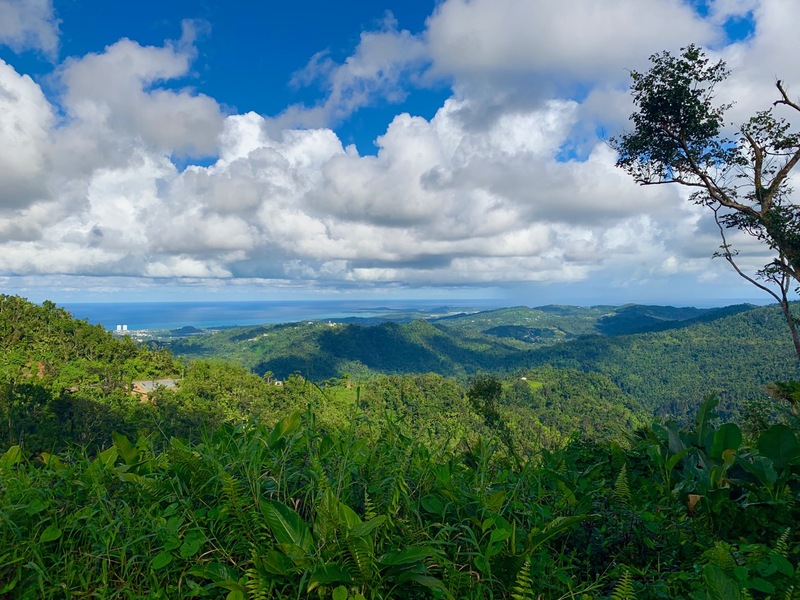 All in all, we spent about 2 hours in El Yunque, which, for that day, felt like the right amount of time. We arrived back at our apartment a little after 4 PM and I set about repacking and doing some rearranging for our departure the following morning while Roger rested and Emmaline watched some Netflix. Around 5:30 we made our way up to the main road, stopping into a little bakery to pick up some dessert and then we went to a little restaurant called Molini's. They have a little chalkboard with the menu options for the day and we enjoyed some local cuisine (cash only) before making our way back to our apartment. It was a little early, but we decided to finish packing and turn in so we could be up in the morning and beat the traffic back to the car rental return. cadien and lilsonicfan like this. The rental car people had told us to allow LOTS of time to get the car returned on Sunday morning because of the traffic for the festival. We needed to return the car by 10:30 AM so we ate breakfast and left our apartment at 9:40 AM stopping for gas along the way, encountering zero traffic and arriving there in about 15 minutes. Upon returning the car, the car rental company said that they couldn't give us our promised shuttle ride to the cruise port because of the festival (which is one reason we had rented from this company). They did, however, give us a $20 credit on our bill so that we could take a taxi to port. So we hopped across the street to a hotel and picked up a cab there. We encountered a little traffic on the way to the port, but not too much, arriving at the port around 10:30 AM, which was earlier than our assigned Port Arrival Time of 11 AM, but the place was already bustling. There was a huge line to drop luggage and enter the port and we waited for quite awhile outside, chatting with others around us about the unusually long line for luggage drop and ID check. It definitely seemed a little less smooth than other ports (at this point, we've embarked from Port Canaveral, Miami, Vancouver, and Barcelona so we have a few ports we can compare with). Eventually we made it inside, through security screening and into the checkin line where we were shunted into the previous cruiser line full of people (while the new cruiser line was completely empty). Finally, around 11:15 AM, we made it into the large warehouse-like waiting area with folding chairs set up (very similar to Vancouver, actually, but with worse lighting). 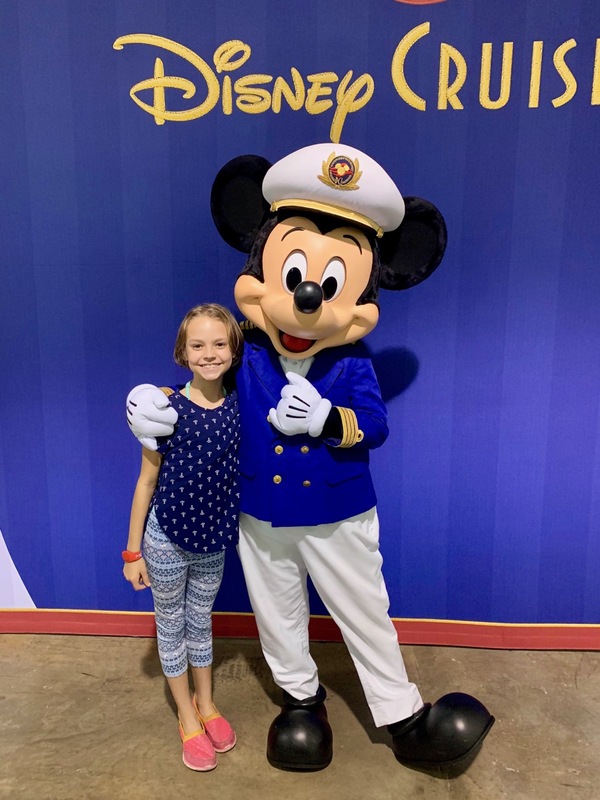 Emmaline got into line to meet Mickey and I stayed with her to take her photo since there were no ship photographers there. Boarding began at around 11:45 AM and our boarding group (four) was called right around noon. We went straight up for lunch at Cabana's then after that Emmaline wanted to swim and slide so we went out to the pools and found a table. 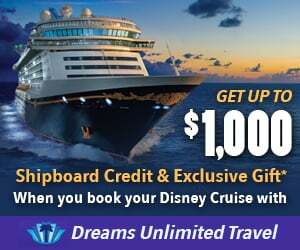 From there, I went to go check in the fitness center for when the sign up sheets would be available for spin class (since it seems to be different on some cruises) and also checked the Port Adventures desk for the Talent Show sign up (not out yet). 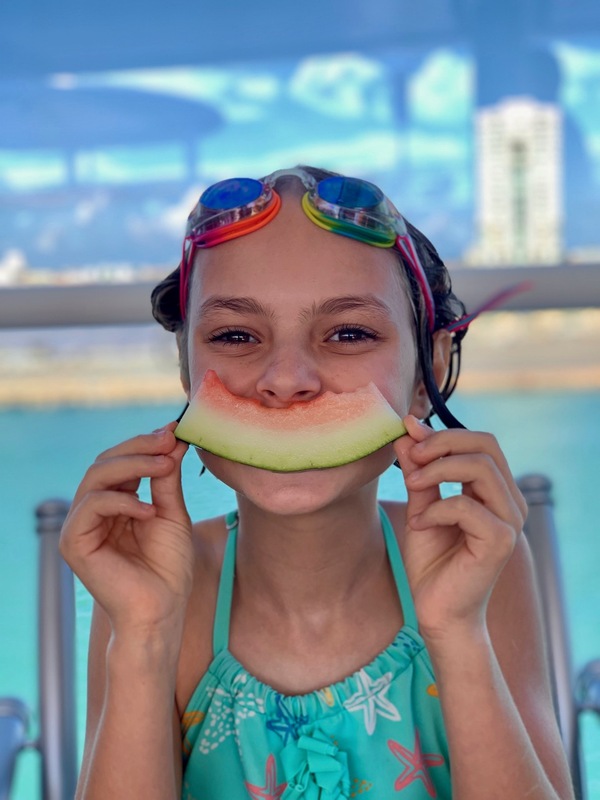 I met back up with Emmaline and Roger on the pool deck and we had some snacks and ice cream before our room was ready at 1:30 PM. Emmaline showered while we relaxed in the room and surprisingly, our luggage arrived quite early at 2:30 PM. 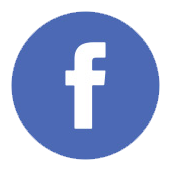 We unpacked until it was time to go to our Facebook group meet and greet in the Promenade Lounge from 3-4 PM. 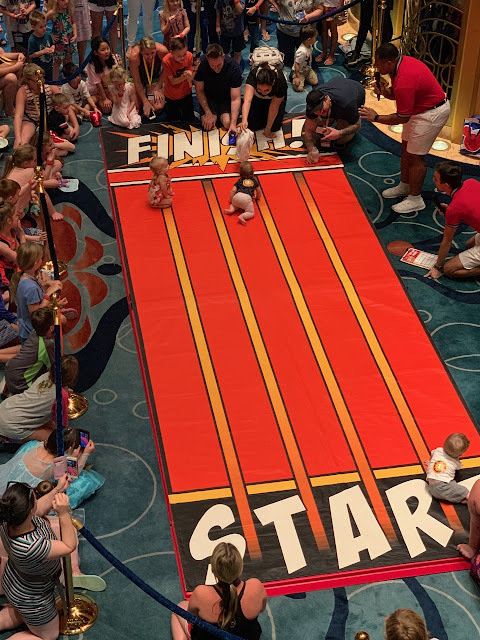 After the meet and greet, it was time for the Muster Drill at 4:15 PM and then the sail away party at 4:45 PM. 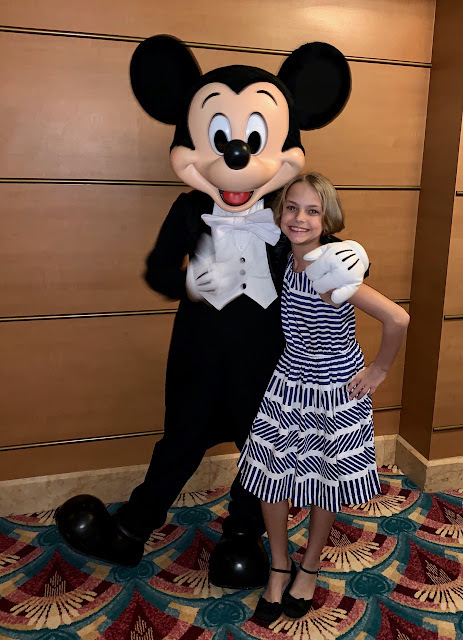 I went with Emmaline to the sail away party for a little bit and they blew the "When You Wish Upon a Star" horn and we sailed away at 5:15 PM (that horn never gets old). 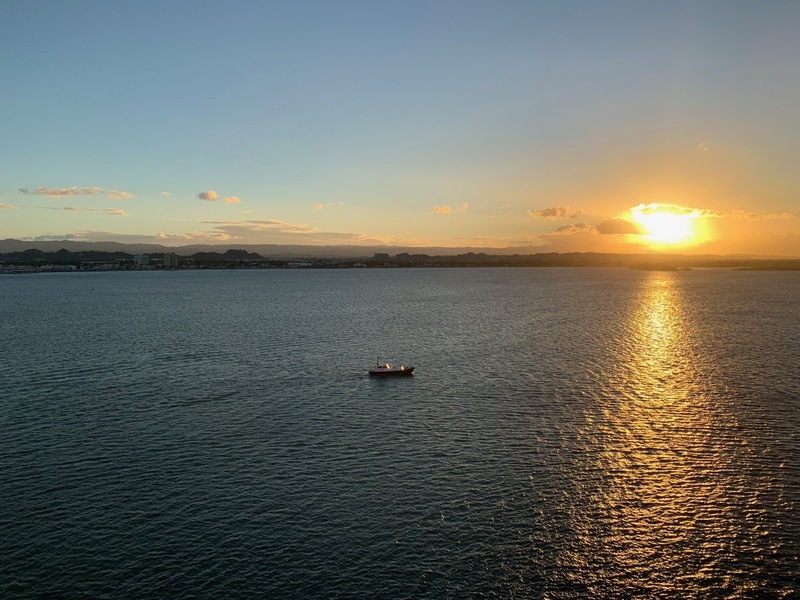 We watched San Juan fade into the distance and the sun begin to set from Deck 10 as we sailed away before returning to our room to complete the rest of our unpacking and get ready for the show at 6:30 PM. The show for the evening was a variety entertainer, John Charles who was described as "music and comedy." He did a solo performance with his acoustic guitar, playing current and old songs with a twist of humor, changing up words (a la Weird Al) or ironically performing pop hits from Lady Gaga to Imagine Dragons. He took requests from the audience, including Emmaline, who asked for The Beatles, and when asked which song, I suggested some of her favorite songs into her ear and she settled on "Blackbird," which he played unironically, commenting at the end that he was showing that he could, on occasion, play a serious song well (and he did). It was an enjoyable show and nice to have something slightly different in the Walt Disney Theatre. After the show, we made our way to Azure, one of the venues onboard that turns into an adult club later in the evening (but earlier has activities for families, generally) and played "Disney Tune Trivia" in which we had to listen to a short clip of music and identify the song, movie it was from and answer a trivia question about the movie. We did fairly well, but did not win (someone actually got every single question right). It was a fun diversion, however, before dinner. At 8:15 PM we arrived for our assigned dining time at Triton's. I quite like the standard menu in Triton's and enjoyed our meal very much. Emmaline seemed to hit it off with the other girl that was also assigned to our table and we had some nice conversations with our table mates, a single dad and an old school friend he had brought along with him. After dinner, we made our way back to our stateroom and went directly to bed. 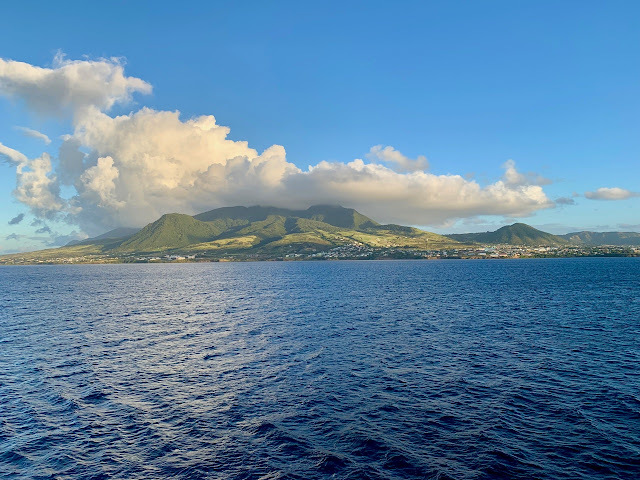 We didn't have a super early morning the next morning, but we were tired from the day's events and wanted to be fresh and ready for our first port the next day, Tortola, B.V.I. 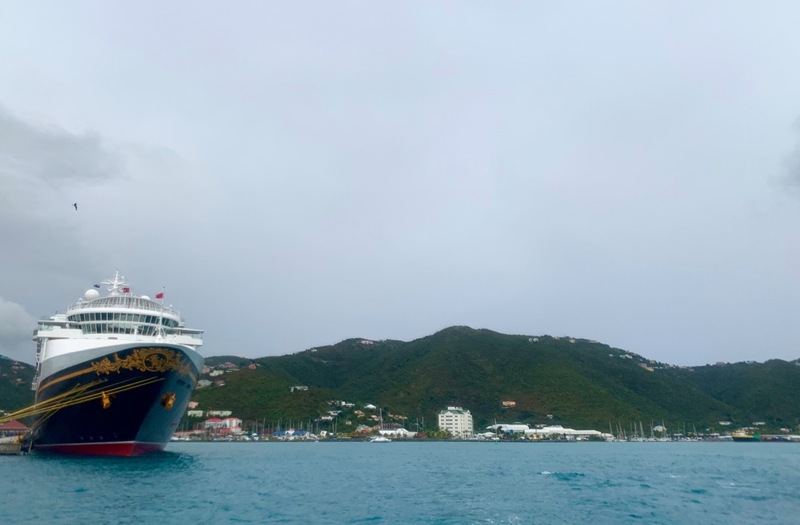 We woke up already docked in Tortola and went up to Cabana's for breakfast. After breakfast we met up with some folks from our cruse meet group who were also going on our excursion and disembarked the ship. 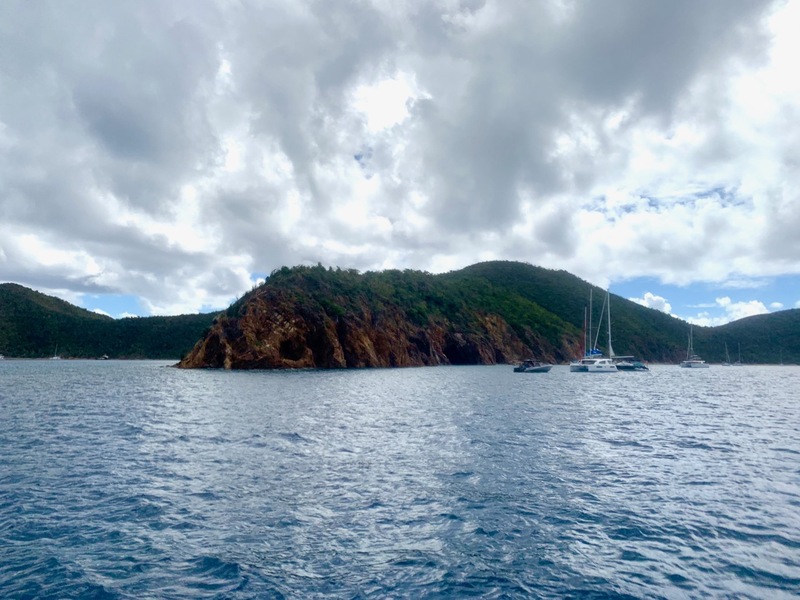 We walked about 5-10 minutes to the Village Cay Marina where we would be boarding a catamaran for Norman Island with Aristocat Charters. Last year, on our Facebook cruise meet group, someone had set up a charter that others could also join in on. If enough people signed up, the charter would sail with our group. As it happened, I believe we filled all 30 slots on the charter. The rain passed quickly and the tour operators came and found us and took us out the catamaran and we set out, sailing south from Road Town, Tortola, around Peter Island (a private island currently owned by a company who operates a resort there) to Norman Island (supposedly the island featured in "Treasure Island"). Once we arrived near Norman Island, we stopped at a spot along a rocky shore for a little snorkeling. 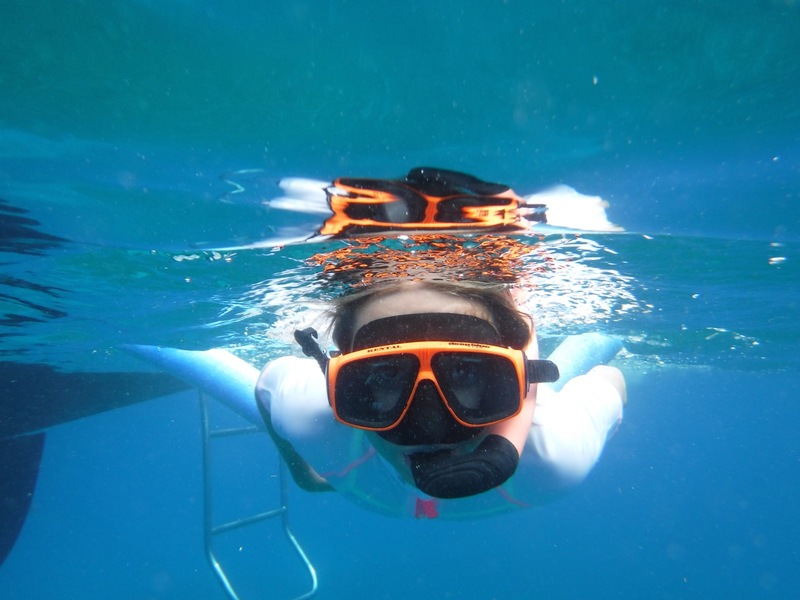 Emmaline was hesitant and a little nervous at first, but once she got the hang of it and saw all the things she could see under the water, she enjoyed it. 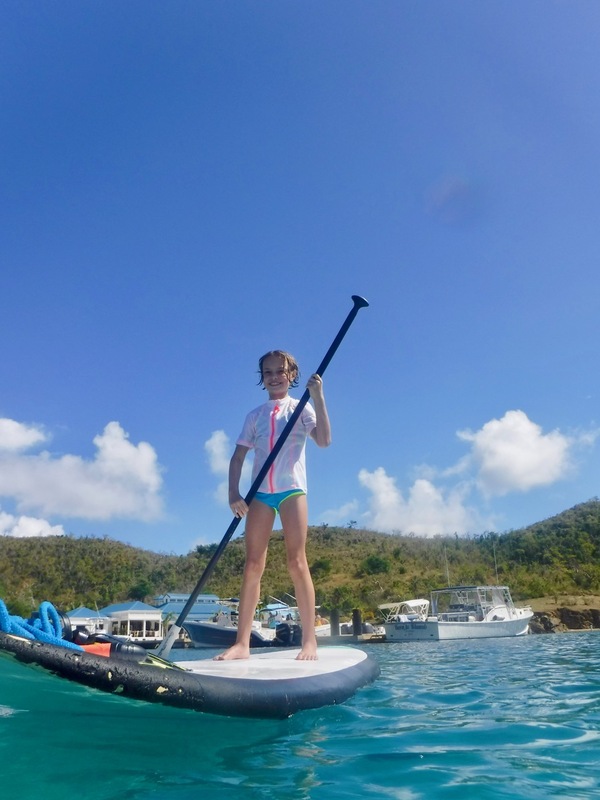 They also had two paddle boards on the catamaran that folks could use to paddle around the area. The water was cool but not cold (apparently around 78 when I looked it up later, but it felt colder to me) and we adjusted quickly once in the water. 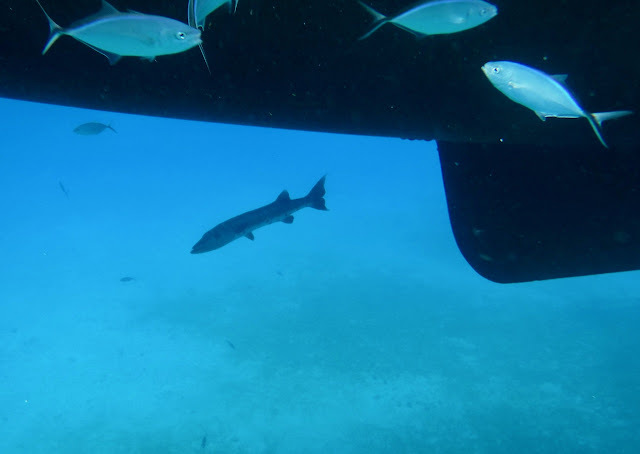 We saw lots of different kinds of fish and even a barracuda that was chilling out in the shade under the boat. 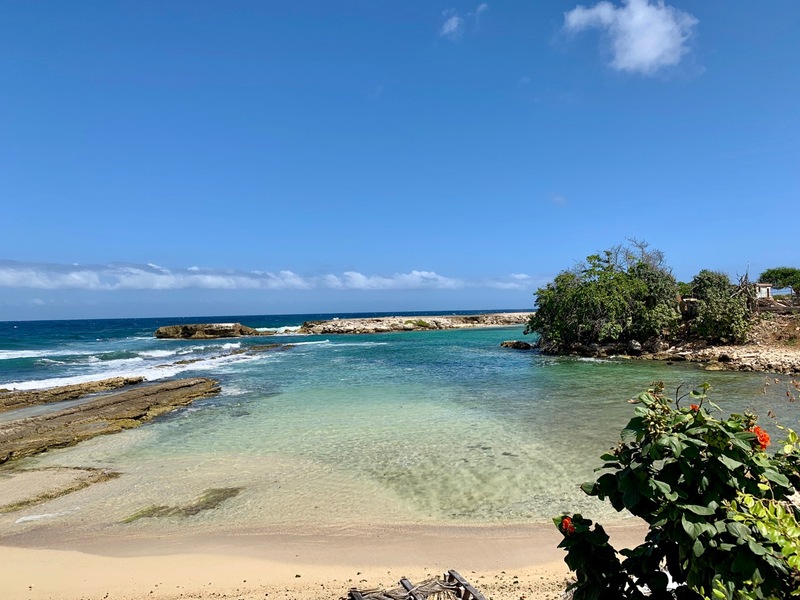 After we snorkeled there for awhile, we moved on to a little cove with a beach (Bight Bay) and even a little restaurant (Pirates Bight). We moored a little ways off from the beach (probably around 300 meters by my estimation) and they brought up some lunch. While we ate lunch, some folks decided to take the paddle boards to shore...and leave them there. So pretty much the options were to either swim all the way in to the beach, or swim a much shorter distance (maybe 50 meters or so) to a rocky shore and from there, get out of the water and clamber over a rocky pathway to get to the beach area. Some folks grabbed a pool noodle and took this latter option but Emmaline had really been wanting to have a go at the paddle board on her own (she had ridden earlier with Roger as a passenger) and she was unhappy that both paddle boards were now stuck on the beach. I had packed my swim goggles in the beach bag so, donning these (and wishing I'd packed a cap), I swam to the beach. I really enjoyed my swim to the shore, feeling good and strong being back in open water and having a real swim. I even spotted a couple small sea turtles along the way, which was really neat. I grabbed the paddle board and paddled my way back to the boat. Once there, I accompanied Emmaline (swimming alongside her in the water) to the beach while she paddled then I took the other board back to the boat so others could use it. 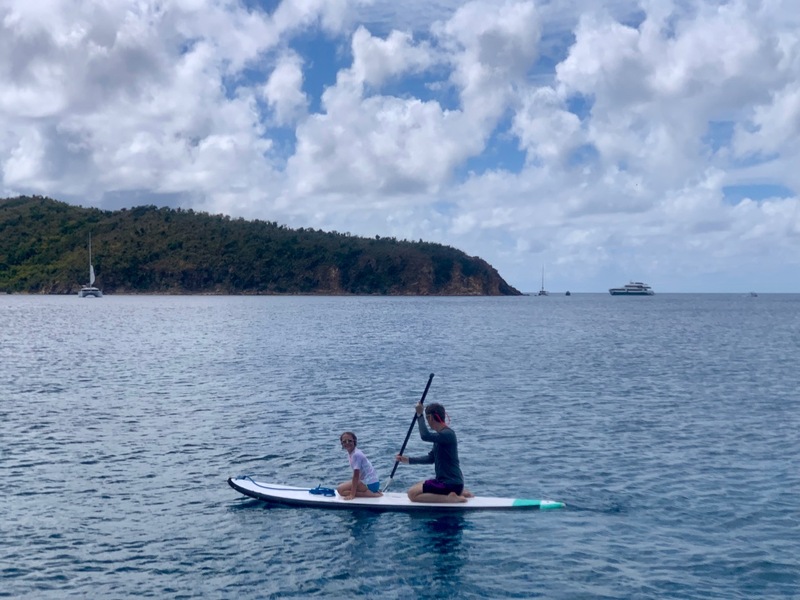 At some point Roger paddled out to the beach as well and I ferried paddle boards in various directions and swam back and forth, probably making 5-6 round trips at lease. All the while, I was enjoying myself swimming and paddling. 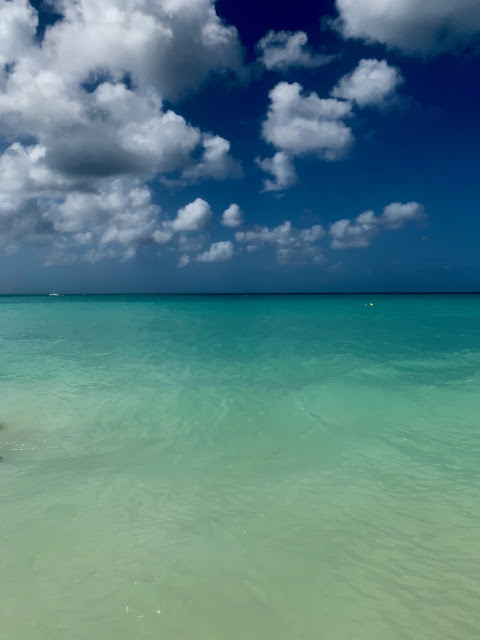 According to my Apple Watch, I did 90 minutes of "Exercise" that day, probably most of it was that swimming, though probably some was paddling the paddle board. The crew thanked me for the ferrying, commenting that I must be a swimmer! Eventually it was time to load up and move on, this time we made our way to The Indians. The Indians are four rocks that protrude from open water a little north of Norman Island. It's unprotected so the water can be a bit choppy. Our guides recommended noodles for everyone (I hadn't been using a noodle all day and even though I probably would have been fine, I took one anyway). 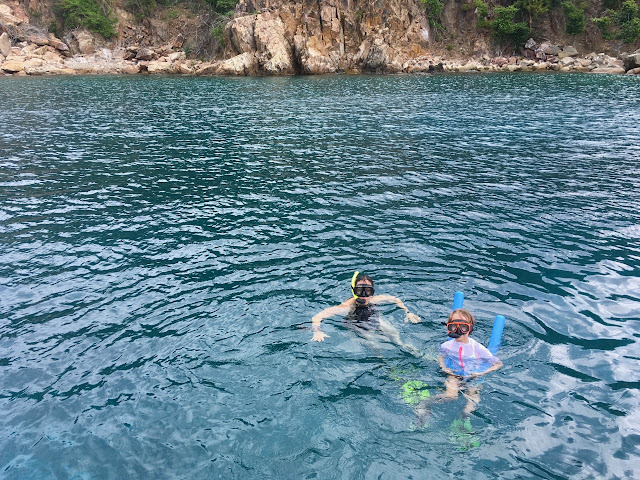 Emmaline and I went back into the water and this was definitely the best snorkeling all day. There was a lot of coral and all kinds of fish and even little crabs scuttling over the rocks that stuck up out of the ocean. After some time there, we packed up again and made our way back to Road Town, Tortola. We said good-bye to our guides and made our way back onboard the Wonder around 4 PM. We ordered some fruit and a cheese and cracker platter from room service ("All Hands On Deck") and we all rotated through the shower while Mickey Mouse cartoons played on the stateroom TV. We got ourselves ready for formal night but we decided to skip the show, The Golden Mickeys, because, of all the shows, it's probably the one we've seen the most. 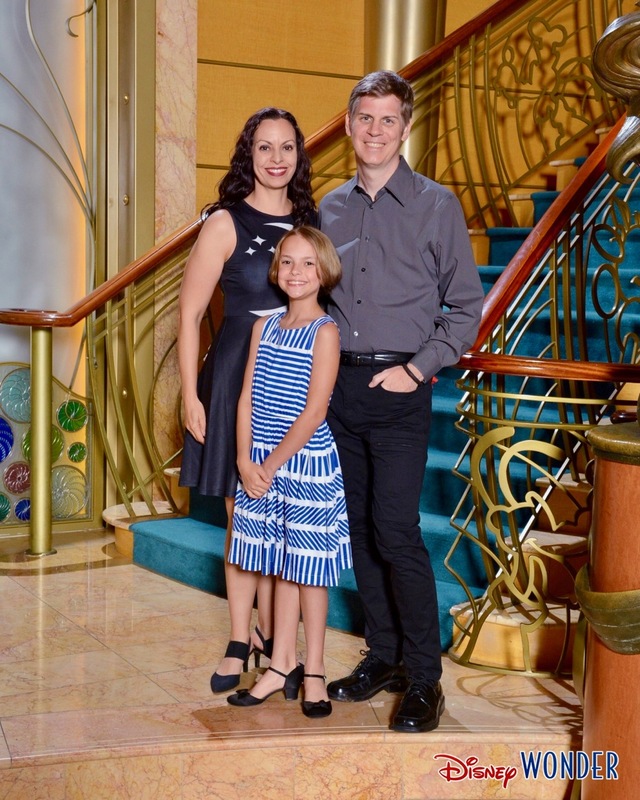 At 7:15, all doled up, we went and took some photos in our formal outfits, however, we didn't end up buying them because at the end of the cruise, we preferred the photos from semi-formal night more. Then at 8:15 we went to dinner for our first of two nights in a row in Animator's Palate. I actually think I enjoy the show with Sorcerer Mickey at the end more than the animation show. It's fun to animate your own character, but I just love watching the drawings progress and come to life and then when Mickey comes out, the joy on all the faces is so much fun. I always get a little something in both my eyes! After dinner, we were pretty zonked from spending a day in the sun so we went back to the room and went right to bed. 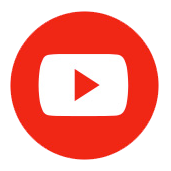 TestingH2O and lilsonicfan like this. When we lived in Louisiana, in the 90s, there was a cafe called "Cajun Cafe", it was family owned and the menu was written, daily, on a chalkboard, then as they ran out of dishes, those items would be marked through. We always loved it when Grand-Mère would sit down at our table to take our order and tell us that we must eat the bread pudding today. Molini's sounds a bit like Cajun Cafe. Looking forward to hearing about more of your trip. Let me back up a bit. 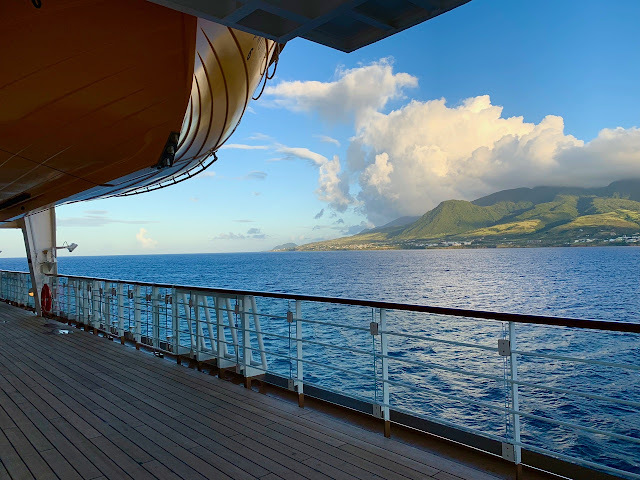 I woke up at 7 AM, tossed on my running clothes and went up to deck 4 for what I hoped were full laps around the deck before they closed the forward section for mooring operations. The all ashore time was 8:30 so I thought I was early enough, but when I arrived on deck 4, I saw a couple of runners coming in the wrong direction so I knew right away it must be closed. So I started my U-shaped run with everyone else, being careful in the narrow sections to look for runners and walkers going in the opposite direction. I completed my run and did a few sets up pushups on the deck before I went back to the room and showered before we all went to Cabana's for breakfast. Our meeting time for the tour was 9:30 AM so we disembarked at 9:15 so as to be on time. We found the meeting spot for our tour and were given wrist bands and a little after that another family from DCL showed up. The tour operator told us they were waiting for a few more people from another ship that was just docking, I think it was a Carnival ship. He said it would be about 9:45 for our departure. I should have said something right then because that ship was just coming in and still needed to tie down and get cleared by the port authority. But I wasn't thinking about it. 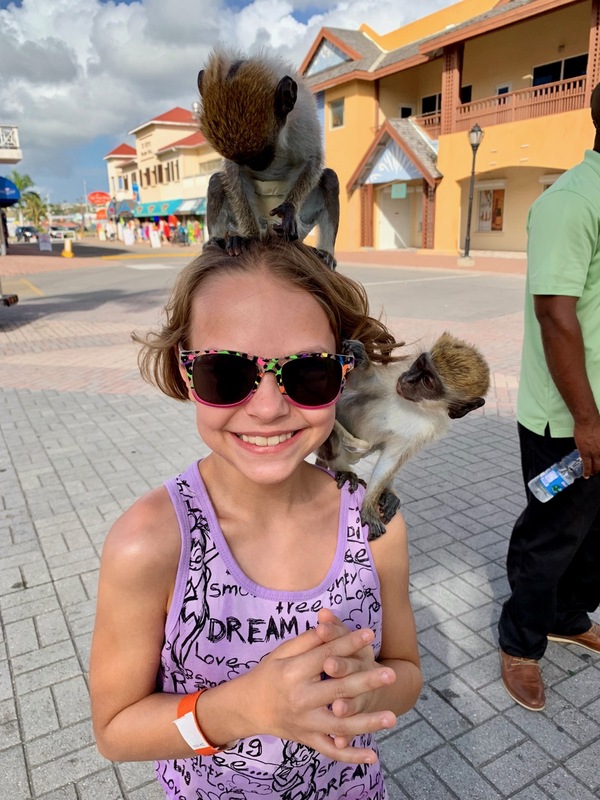 So we did a little shopping and paid a guy way too much money so that Emmaline could have monkeys crawl all over her for about 30 seconds. We checked back in at 9:45 but they said to wait some more so we waited and found some free (but sloooooow) wi-fi so we could check in with family. At 10:00 I went to ask them what the deal was and they said that they were still waiting on the other ship, that it had been late and it was beyond their control. We kept waiting and at 10:15 another couple arrived. I asked them if they knew why the ship was late. They said it wasn't late. Uh. Okay? I asked them what time their tour was supposed to be and they said, "Oh, I dunno, just whenever we got here." Okaaaaay. So we waited some more. And some more. 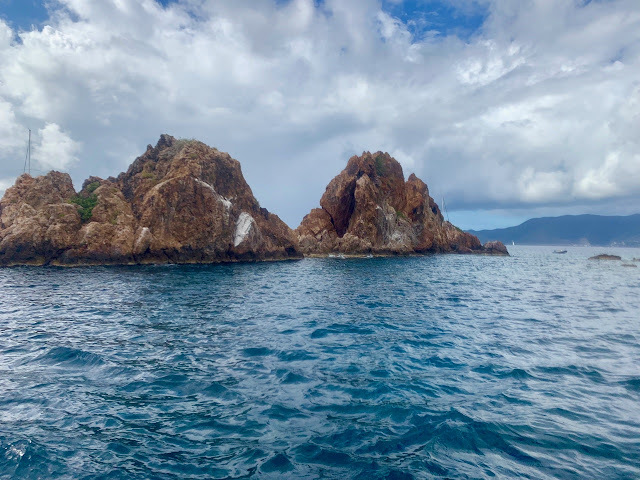 I went back over to the tour guide and said that we really didn't feel like we should wait much longer, that the ship had been docked for quite awhile. He said he had a lot of people on the tour from that ship that weren't there, but he finally said that he would cut it off at 11:00 and not wait any longer. We were all sort of tired and out of sorts and I was annoyed that it was supposed to be a 4 hour tour that started at 9:30. Now it's 11:00 and I wasn't even sure what "lunch" was going to look like at this point because I had pictured being back by 1:30. Nobody else showed up and we finally boarded the small air conditioned tour bus with three other families and were off. 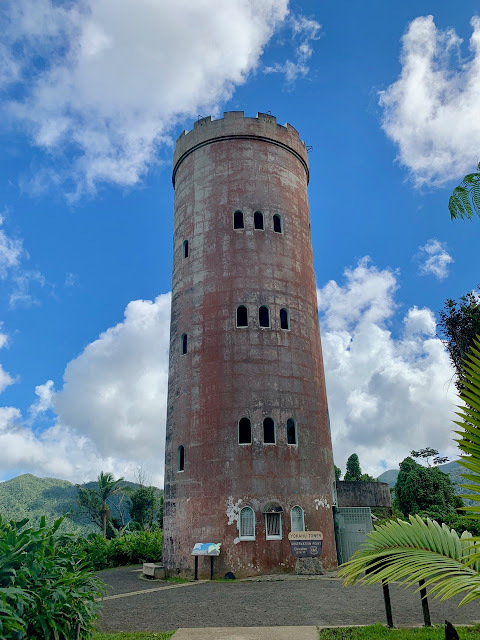 First we drove a little around Basseterre and learned a little about some of the history of the area. St. Kitts and its sister island of Nevis together make up one nation that gained their independence from Great Britain in 1983. 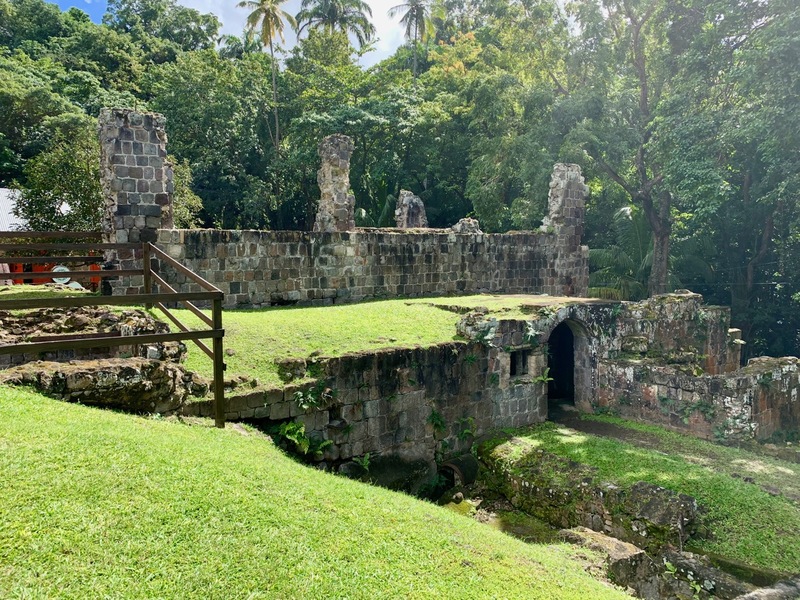 They were colonized at various times by the Spanish, French, and British and the island was primarily a source of sugarcane. Our first stop was to visit the Wingfield Estate. 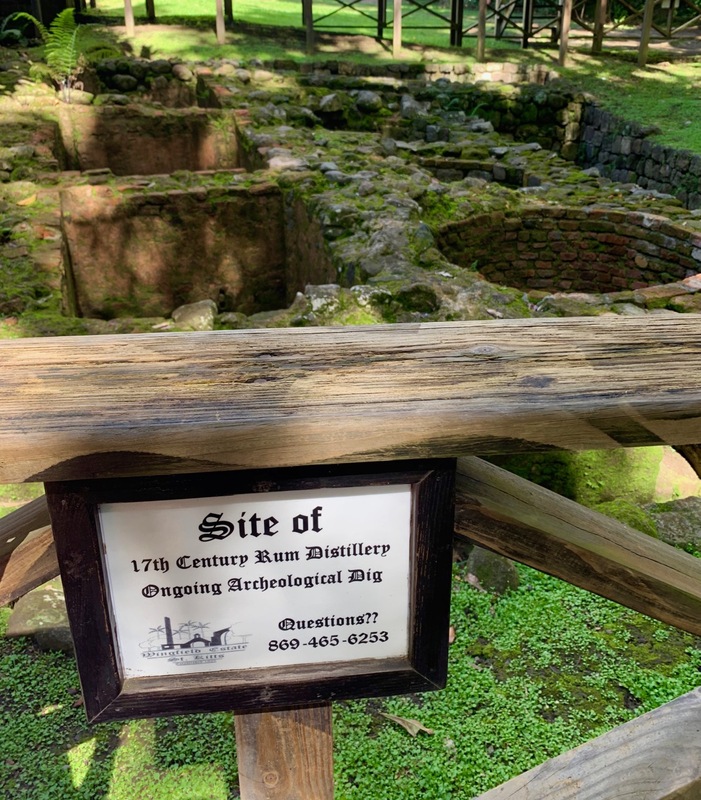 These ruins consist of an abandoned sugar factory and rum distillery where there are excavations ongoing to unearth the various parts of the property. We walked around and our guide told us about the lives of the slaves who worked there and how sugar was processed and the rum was created. The property was interesting the rainforest right next to the ruins was lush and beautiful. 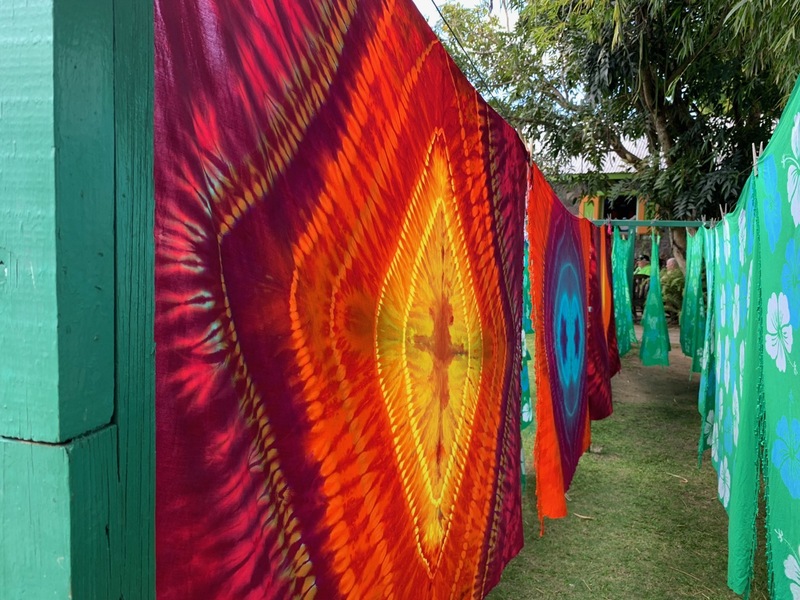 We left Wingfield and next stopped at Caribelle Batik at Romney Manor where we got to see a batik demonstration and walk the grounds. To be honest, I could have skipped this stop. We were there longer than we really needed to be and it was mostly a large gift shop of items made from batik fabric. 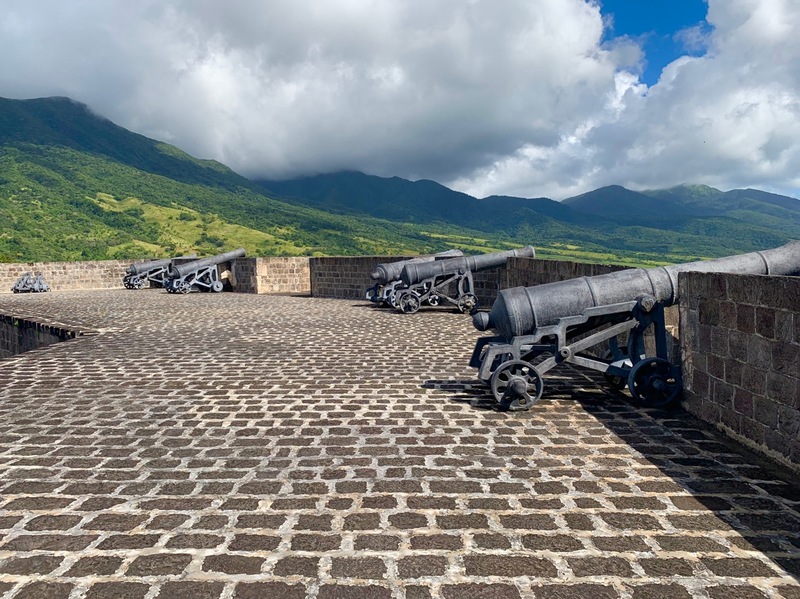 Our next stop was the Brimstone Hill Fortress. 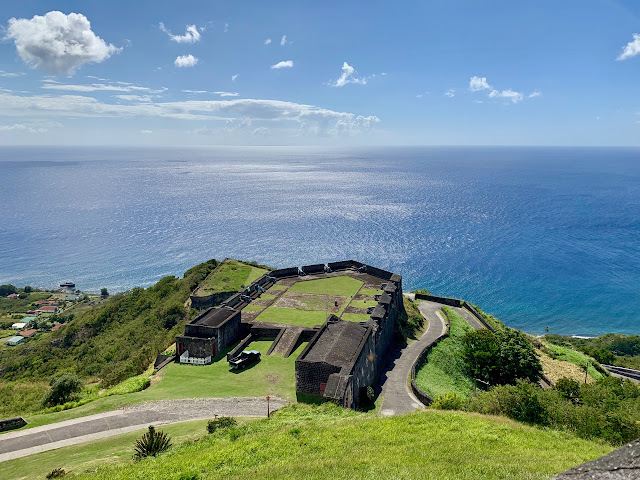 This well-preserved fortress was built the British (well, no, not really, slaves built it for the British) while they had control of the island. It's impressive in scale and setting and the views of the island from the top of the hill were amazing. We spent quite a bit of time there and actually could have spent more. In all honesty, I could have just had a great excursion going only to the fortress and been perfectly happy with our day. By this point, it was getting later on in the day and we were hungry and tired and done and I was still a little annoyed that we started our tour an hour and a half late. But we had a couple more stops. First, we stopped at the black rocks and took some photos there. It was pretty to see the volcanic rock formations in the ocean (but I would have been okay skipping) and then we headed to the south of the island atop a hill where you can see the Atlantic Ocean on the left and the Caribbean Sea to the right. It was a breathtaking view and I have to say, that was actually worth a stop. By the time we made it back to the ship, it was around 3:45. So not only did our tour leave an hour and a half late, but instead of being a four hour tour, it was nearly 5 hours. Overall, it was a good tour, but it would have been a great tour if it had been shorter (like 3 hours) and had started on time. We dropped our stuff off in the room and went up to deck 9 to find "lunch" since Cabana's was long since closed at that point. Roger had a burger from Pete's, I had a surprisingly good caprese panini from Daisy's and Emmaline had some fruit and a chocolate chip cookie from Daisy's. I think we all shared some fries Roger had also gotten from Pete's. After lunch, we went back to the room to freshen up and regroup and after a bit, Emmaline went to the kids club while Roger and I relaxed in the room before it was time for the show. I grabbed Emmaline from the club at 6:00, we refilled the popcorn bucket and went into the Walt Disney Theatre to enjoy the illusions of David Gatti. He's actually one of the better illusionists I've seen on DCL and I really enjoyed his show quite a bit. Roger found it a little disjointed because he had segments where he was dramatic with music, other segments with audience members and others that were humorous. Personally, I liked the variety and didn't mind the different styles. 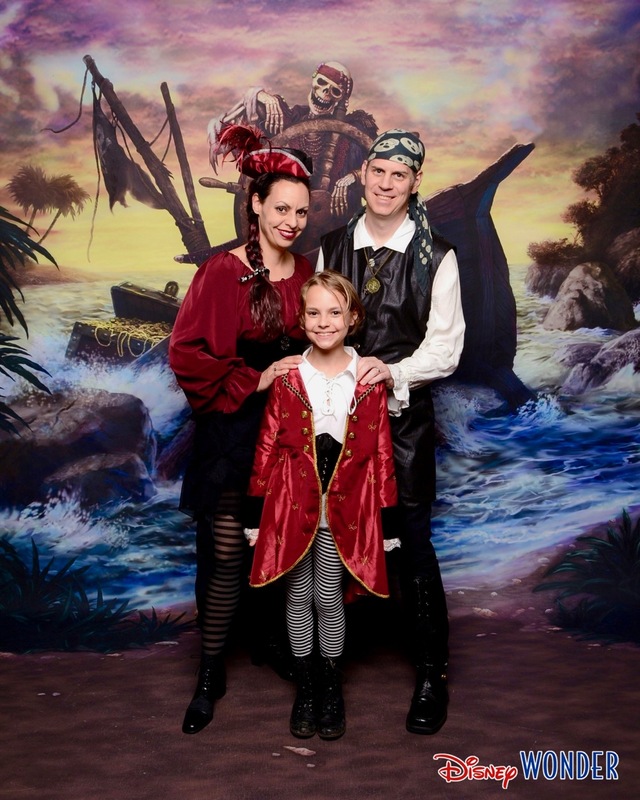 After the show, we got all our pirate costumes on and went down to have photos taken and then we went to Shutters to look at our photos from the cruise so far. Then at 8:15 we went to Animator's Palate for Pirate Night dinner. Pirate Night in Animator's was so great because they could use the screens for some super fun renderings, sketches and other various works of art from different pirate themed rides and shows from Disney. I would definitely prefer to be in Animator's on Pirate Night in the future! After dinner, Emmaline went her friend from our table to get something from her room (or drop something off, I'm not sure) and Roger and I made our way to deck 10 to watch the show and fireworks. We arranged to meet back up with Emmaline across from the ice cream machines on deck 9. The pirate show was the same one we've seen before, but still fun. There was one dad who really hammed it up for the "heavy metal pirates take over and do air guitar" bit (yes, this is really a thing). There's always at least one dad that goes nuts and makes the whole thing awesome. The fireworks were great, too. Disney knows how to do fireworks, even at sea. After the fireworks, we met up with Emmaline and checked out the pirate buffet which was really crowded. We grabbed some fruit and maybe a cookie, but we were still full from dinner so we were pretty half-hearted about the whole affair. We went back to our room and rolled ourselves into bed. It was a long day and we were all super ready for a day at sea the next day. We had planned to do laundry the afternoon prior, in St. Kitts, but we all know how that turned out. Instead I woke up early before Roger and Emmaline, tossed on some clothes, and made my way down the hall to the laundry on deck 2. There was a machine available so I popped my laundry in, set the timer on my watch, and went up to deck 9 with my book where I grabbed a croissant and fruit from Daisy's and a cup of hot cocoa from the drink station. I parked myself with my book when, about 10 minutes in, I got an alert from the DCL app on my phone that the washer had stopped. Checking my watch, I saw that there was still about 20 minutes left on the cycle. Confused, I looked at my half eaten plate and wondered what to do. A few tables away, I saw a lady sitting and reading her book with her breakfast and I asked her if I could leave my items on her table so they wouldn't get cleared away by an efficient crew member. Leaving my book and plate I went down to check the laundry. The washer was still merrily washing away (ah technology) so I went back up to deck 9. As I went to pick up my plate and book, the woman at the table commented on my book ("Becoming" by Michelle Obama) which led to a conversation. I sat down and we passed the time chatting about various things until it was time for me to switch the items to the dryer. I went down and swapped items then made my way back up and we continued our conversation. 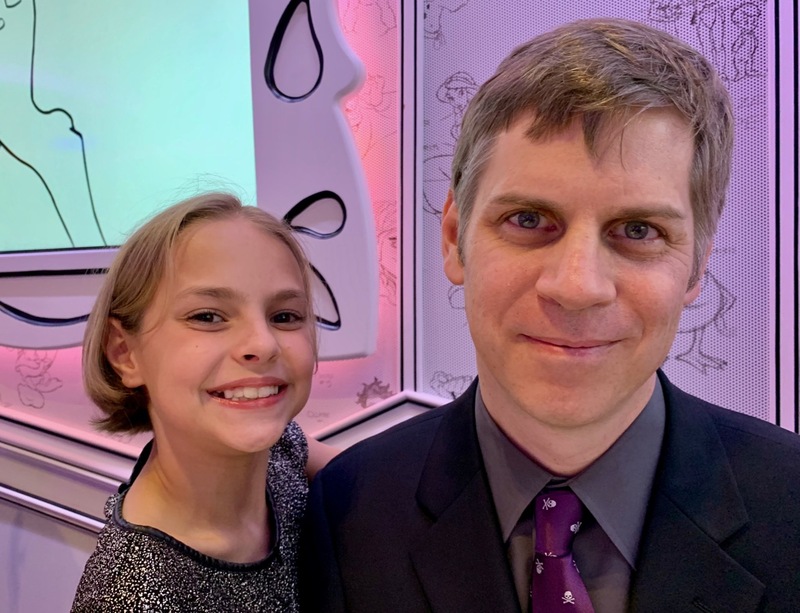 We had a nice chat and it turned out we both had 10 year old daughters and we made plans for them to meet up (which, regrettably never happened). Eventually it was time for the dryer to be done so I went down and grabbed the laundry and took it back to the room. Roger was awake, but Emmaline was still catching up on sleep. We put away the clean clothes and eventually encouraged Emmaline to get up so we could be on time for breakfast as we had a character breakfast scheduled for Animator's Palate for 9:30 AM. After breakfast, Emmaline and I headed out to participate in Anna's Chocolate Chase, a sort of scavenger hunt whereby we're given a piece of paper with clues and we have to go all around the ship to find the locations and note down pictures we find there. Then we handed out some of our Fish Extender gifts. By 11:30 we were back at the room to regroup. At 11:45 it was our assigned time for our princess meet and greet. I presume that one day Emmaline will be done meeting princesses but apparently we aren't there yet so we went and met Cinderella, Tiana, Belle and Arial in the atrium. After that she wanted to finish delivering the Fish Extender gifts so we did that. When we were done, we went back to the room to figure out what to do next. Emmaline saw on the Navigator that Daisy was greeting so she went off to do that then when she got back, we went to Cabana's for lunch at 12:30. After lunch, we saw that there was a craft to make wind chimes in the Promenade Lounge at 1:00 so Emmaline and I went to do that. While there, we sat with a friend she had previously met at the meet and greet and we all chatted and had a good time. At 1:45 it was time to head over to D Lounge for Talent Show prep. Emmaline had choreographed a dance/light gymnastics routine that she would be performing. Previously when she did the talent show there was a full slate of sign-ups, but this time there were only four acts, including hers, with the other three being from the same family. After the talent show rehearsal, we had our assigned meet and greet with Anna and Elsa so we went to Animator's Palate to do that. After that, Emmaline went off to the kids club to play for a couple of hours and Roger and I went and got some coffee at Cove Cafe. We chatted and also read our books a little bit while there which was relaxing. Emmaline was done around 4:00 and we all had some snacks on deck 9 before I took Emmaline to the Promenade Lounge to play games with her friends for about an hour (they have a variety of board games there). By then it was time for the show so we grabbed our popcorn bucket and made our way to the Walt Disney Theatre for "Frozen: A Musical Spectacular." We had never seen this show before, it being added after our last sailing aboard the Wonder. I was actually really impressed with it. In fact, I enjoyed it more than I did the Rapunzel show on the Magic (which is funny because as a movie and story I prefer Rapunzel to Frozen). After the show, we high-tailed it out of there straight to the D-Lounge for the talent show. Emmaline did a great job with her dance (even though they had a little technical issue with her music and she had to start again). 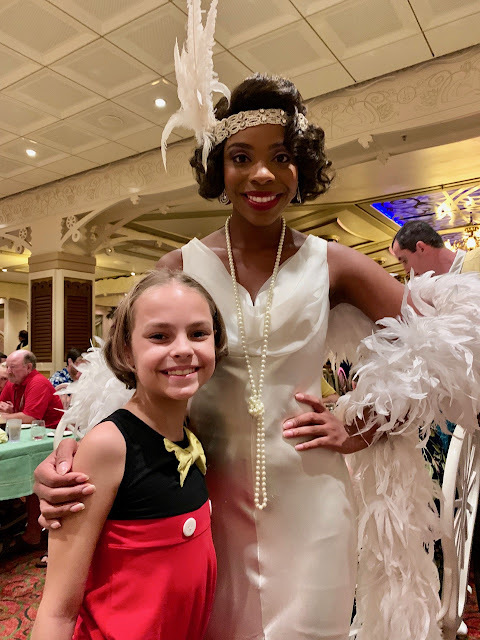 After the talent show, we changed for dinner and went for the first time to Tiana's Place, which was also added after our last sailing on the Wonder. It looks fantastic and the music was also a lot of fun. We had a really great time dining there. Tonight there was no show at dinner so she and her table mate friend headed off for the kid's club to play while the adults finished up. After we were done, we picked her up (much to her dismay) so that we could get some sleep and be fresh for our excursion the next day. 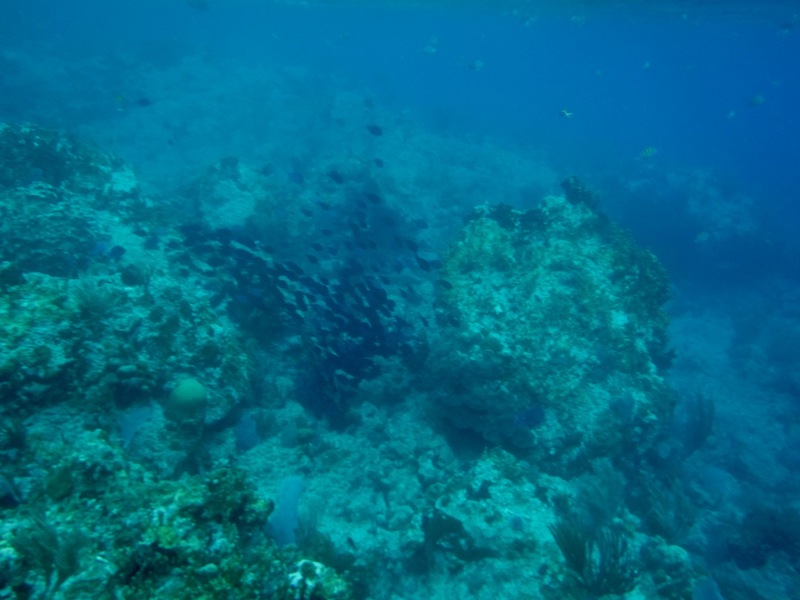 I didn't mention in my entry from our sea day that I had been feeling a little queasy. 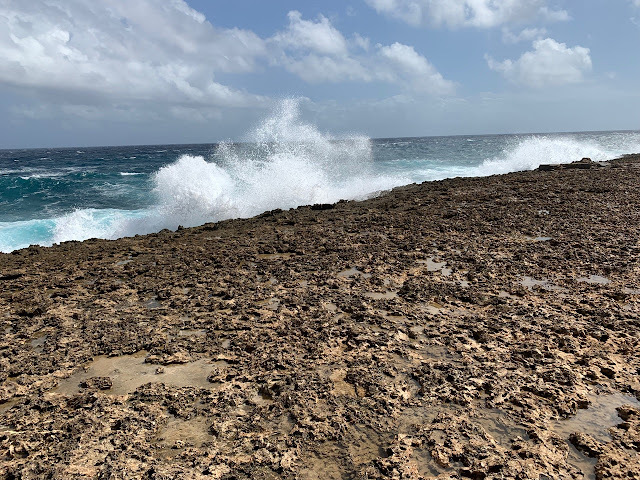 It had gotten pretty windy and the sea was quite choppy and rough during our voyage south to the island of Curaçao. I finally opted to put on a Scopalamine patch, which I haven't needed in several cruises. So when we arrived that morning, it felt good to get off the ship for awhile. We ate breakfast in Cabana's and disembarked at 8:45 to meet at 9 AM for our tour. We had a hard time finding where we were supposed to be. There were two different gates out of the cruise "terminal" area (not really a terminal, more of an outdoor space with kiosks full of tchochkes for sale) and at first we took the wrong one. Eventually we found the right place and our tour guide, Leo. Leo was a twenty-something native guy that, were he an American, I would refer to as a "bruh" and picture him out surfing somewhere. 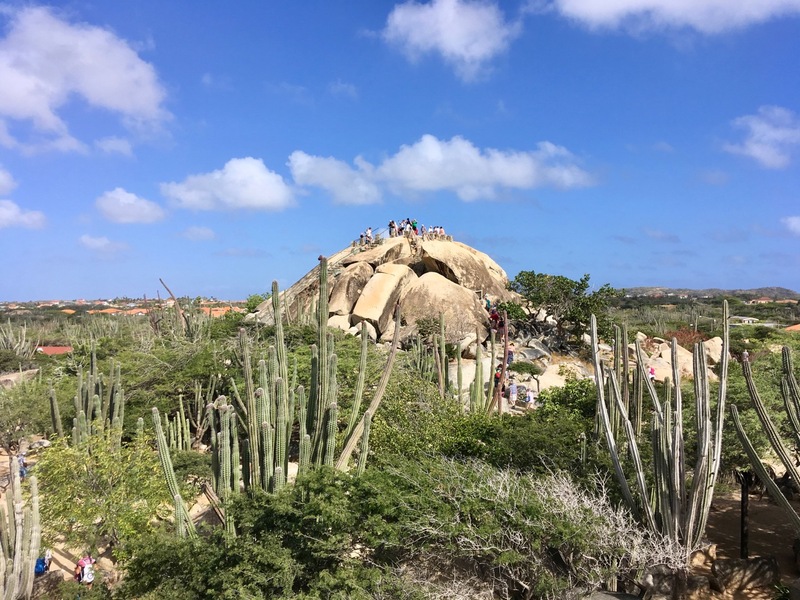 Instead, Leo speaks 6 languages fluently (Papiamentu, Dutch, English, Spanish, French, and Portuguese) and loves guiding tourists through the Curaçao desert on an ATV. 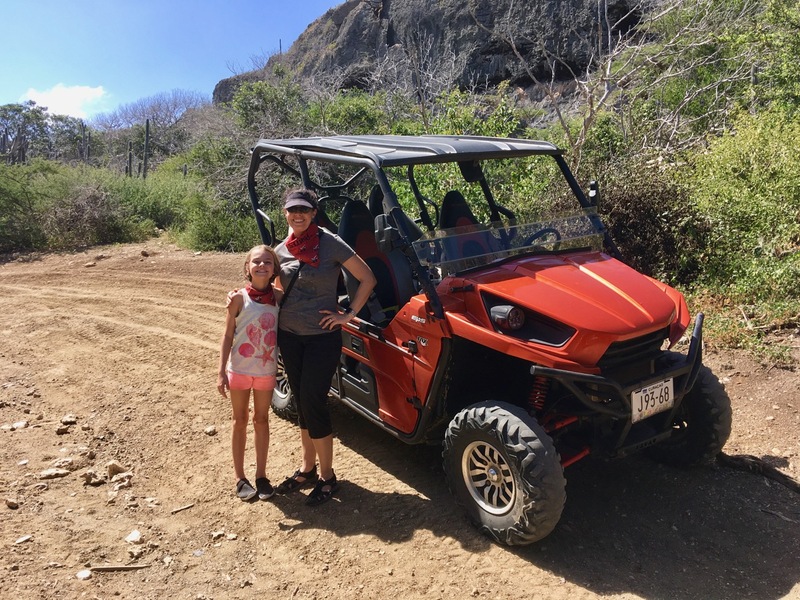 So we hopped into Leo's tricked out passenger van (fancy rims and a custom muffler, y'all) and drove over to the start of the tour where we boarded our ATV buggies to head out into the desert. 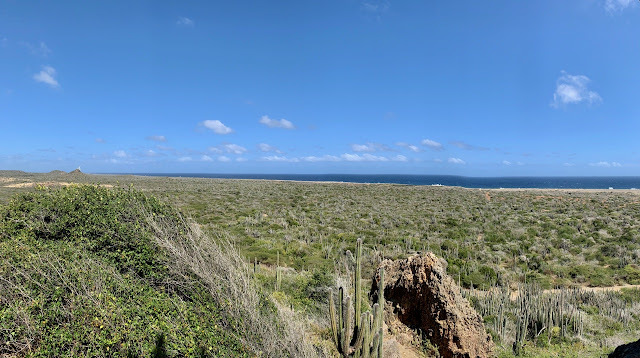 I didn't realize that Curaçao is a desert island (as is Aruba) and it's beautiful in it's craggy starkness with scrub and cacti. 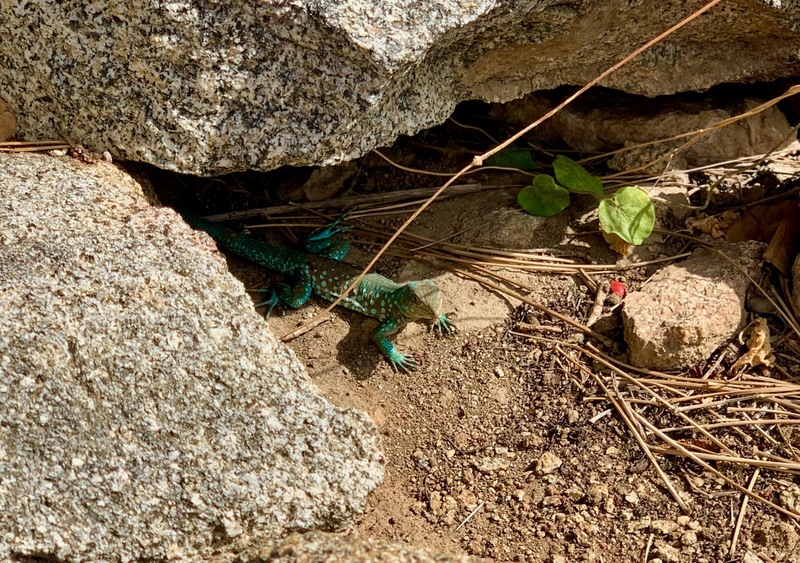 Unfortunately, the residents apparently don't like hauling their trash to the dump so while we were still close to town, the beauty of the desert was often marred by all kinds of garbage. I did the driving on the ATV and Roger commented that it seemed like the cars at Disneyland's Autopia (or Disney World's Tomorrowland Speedway and they were exactly like that. It was a little bit of an adjustment to get the hang of the way the gas pedal worked, which was not like a standard automatic car at all. You almost don't need a brake since it doesn't actually go unless you're putting your foot on the gas. We first wound our way up a hill where we had a panoramic view of the city, Willemstad. 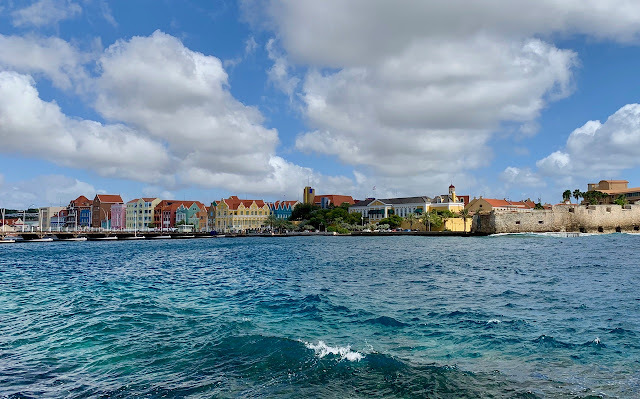 Curaçao is a Dutch island (not an independent nation), though it does have some autonomy, and is the largest island we visited both in land mass and population size. Historically, Curaçao wasn't much good for growing anything and didn't have any gold deposits so it was primarily used as a trading outpost and also, later, as a source of salt. Today, the island houses a large oil refinery. 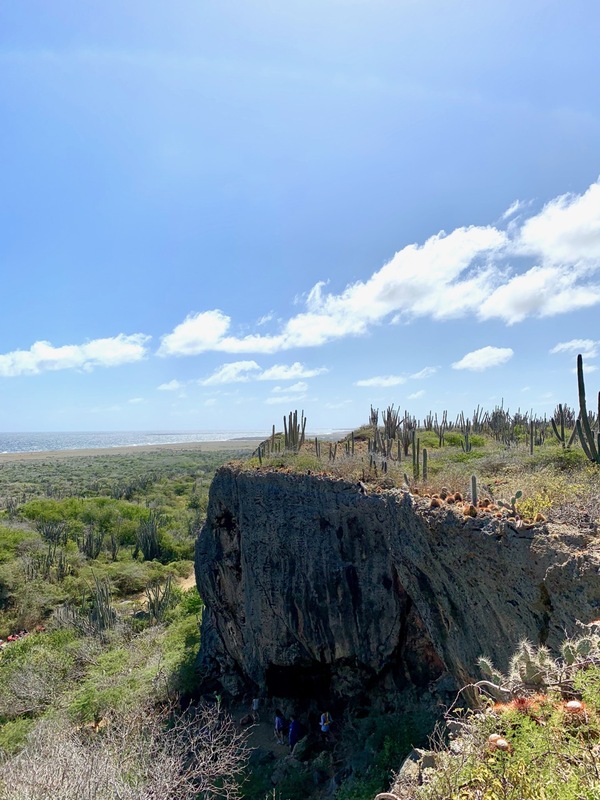 The island is covered in a reddish sand that apparently blows over from Africa and most days there is a slight haze in the air from the Saharan dust. We descended back down the hill and stopped at an Aloe farm and gift shop. I'm not sure how necessary this stop was, honestly, but we took the opportunity to use the bathrooms and apply sunscreen. 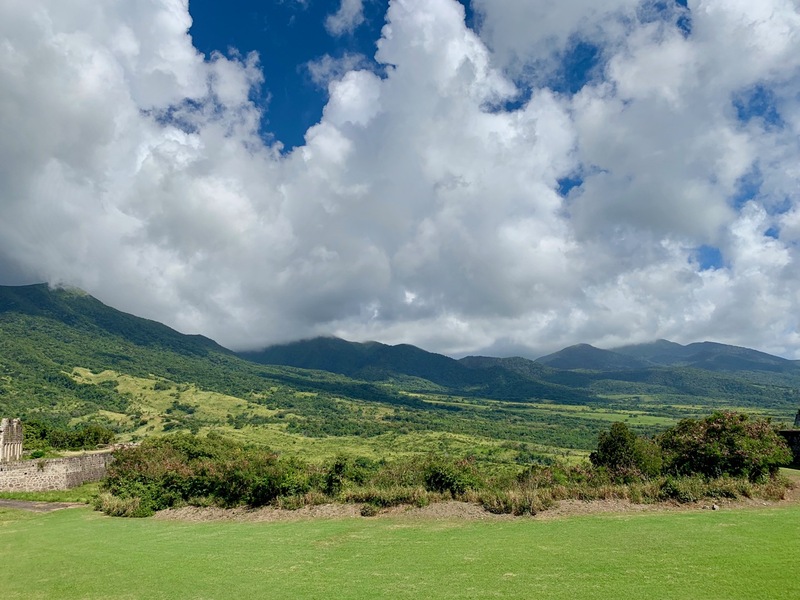 Like the stop at the batik shop in St. Kitts, I sort of suspect that there may be some incentive for tour companies to bring tourists to stop and shop. After leaving the Aloe farm, we made our way to a series of caves. We climbed both into and over the tops of the caves (some aspects of which were sort of technical and definitely for the sure-footed). 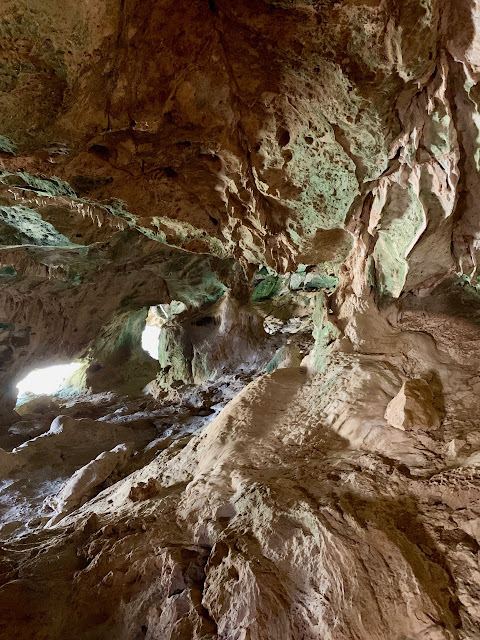 The insides of the caves today are home to bats, but used to be a refuge for native populations. The views from the top of the caves, while very windy, were beautiful. 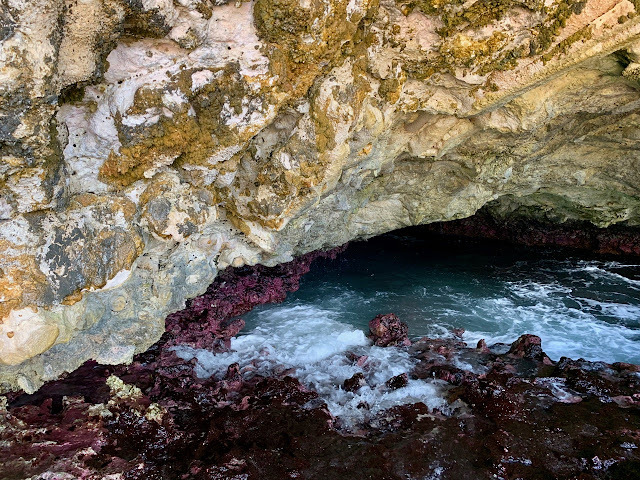 We left the caves and drove to another little cave called "The Cave of Doom" which was a cave next to the ocean where a tunnel feeds sea water up into a cave. As the water recedes, you can see purple coral. It was a really cool little spot. 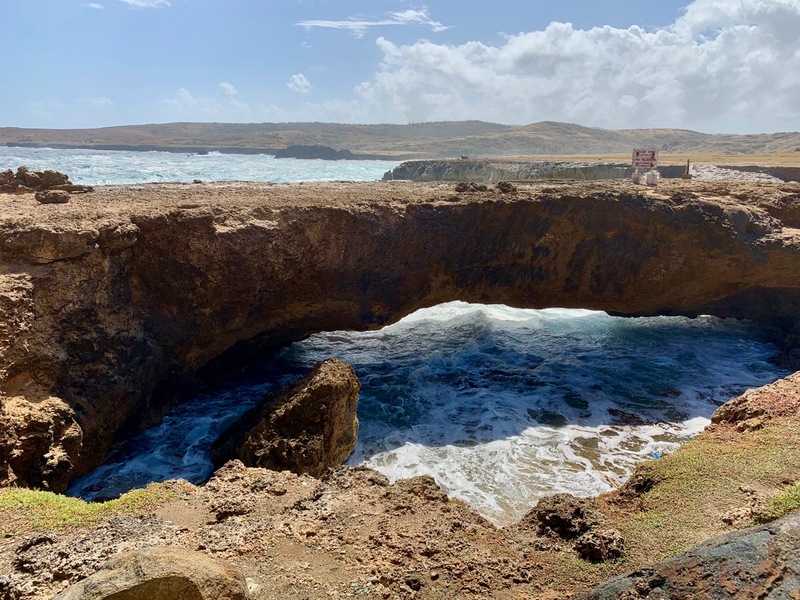 We drove on to the next spot, a natural bridge across the ocean. The sea was rough and the splashing waves spectacular. From there, we drove around a beach area with wind turbines before making our way to a beautiful little cove with a small beach area protected by a series of volcanic rocks. We had some time there to swim and enjoy the serenity of the area. After that, it was time to head back to the tour office and then into the crazy van for the ride back to the ship. We got back to the ship around 1:30 and went up to Cabana's for lunch. 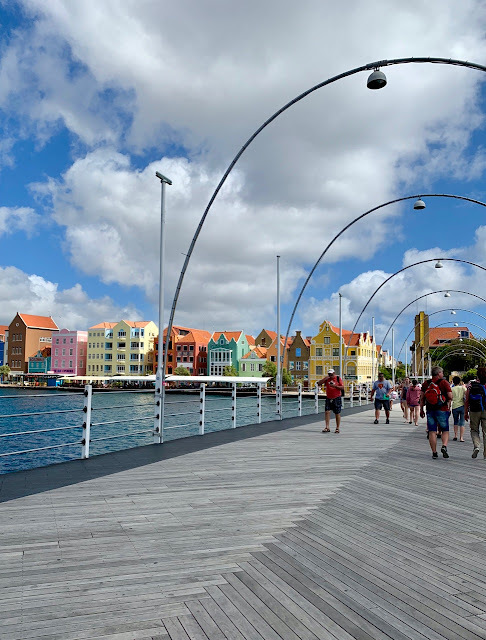 After lunch, Roger and I wanted to debark again and go see the little downtown area of Willemstad. Emmaline wasn't interested so she headed for the club. Roger and I made our way across the Queen Emma Bridge, a hinged pontoon bridge that disconnects and opens up to allow ship traffic to pass through. After crossing the bridge, we walked through the town and checked out a couple shopping areas, but we didn't see anything too interesting. 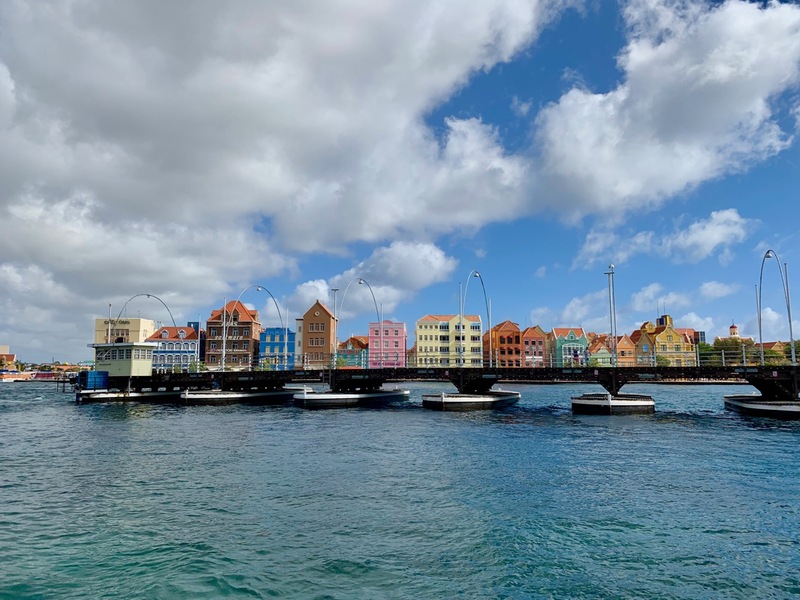 The colorful buildings are cute and the bridge was unique to walk across with its flexion and movement but otherwise, there wasn't much to see in town. As we were heading back for the bridge, the gates to go through were closed and the bridge was opening. Unfortunately, it appeared it was going to be open for awhile, so we followed signs that directed us to the ferry. At the ferry dock, we waited for about 10 minutes for the ferry to take us back across. We boarded the ship around 3:30 after spending about an hour ashore and I checked in with Emmaline in the club. She was done there so she came back to the room with us then at 4:00 went up to deck 9 for "Fun in the Sun." I'm not sure what that entailed - some kind of games up by the pool. While she was there, Roger and I cleaned off the dust and dirt from the ATV tour. Emmaline returned around 4:45 and we all went and got some snacks before meeting Black Widow at 5:15, which was a fun meet and greet. Then back at the room, it was Emmaline's turn to wash up. After she was clean, we went to the Promenade Lounge at 6:15 to complete a flower thermometer craft. The Walt Disney Theatre was showing Mary Poppins at 5:00, but we had already seen it so we skipped. 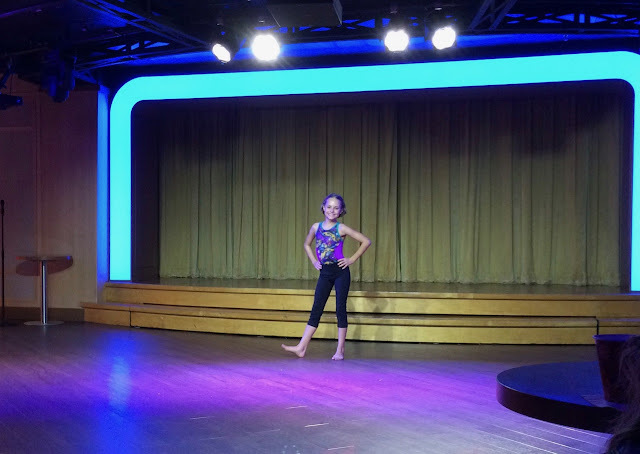 After the craft, Emmaline wanted to go see "Mickey Mania" in D Lounge, which was sort of a Disney trivia game show. Then at 8:15 it was time for dinner and we were back in Triton's for the evening with the "Captain's Gala" menu. The girls left dinner early so that they could go make "Stitch's Space Goo" (aka slime) in the kids club. After we finished our dinner, we picked her up and then it was off to bed to rest up for last port day. I’m really enjoying your report . We’re booked on one of the southerns next year, so it’s fun to read even though our itinerary is a little different. I’m curious, what dining rotation did you have? The itineraries are all so different for the southerns! 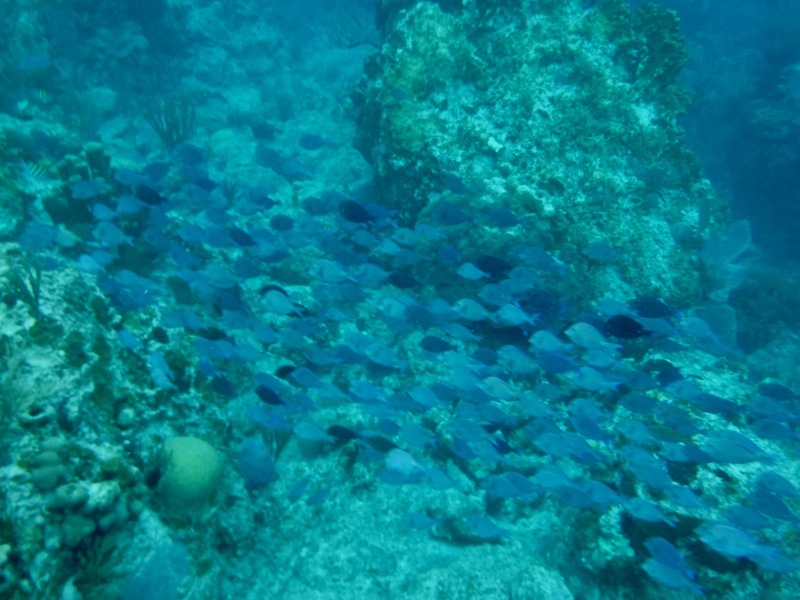 We are booked again for next year on Jan 26 so we can hit a whole other set of islands. I really think Disney needs to offer more southern itineraries. I think they are far more interesting, honestly. We had TR-AP-AP-TP-TR-AP-TP. Thanks! We'll be on the cruise before yours next year. Can't wait! Loving your report! Your description of Leo is so perfect. I can really picture him. 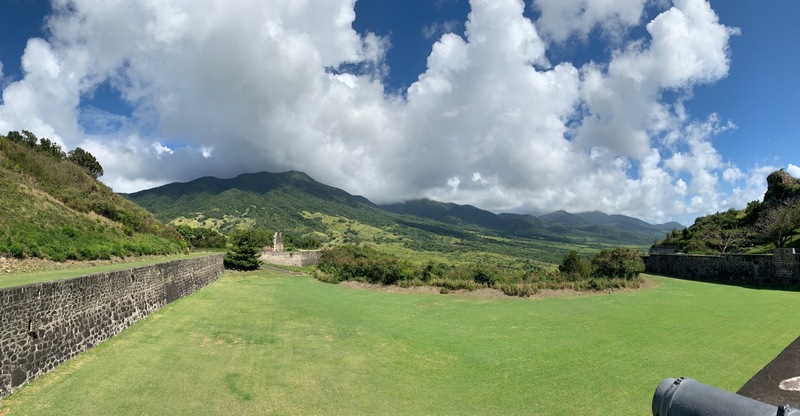 We are in St Kitts this summer on the Fantasy 8 night. Do you mind sharing the tour company name? PM is fine if you're more comfortable. 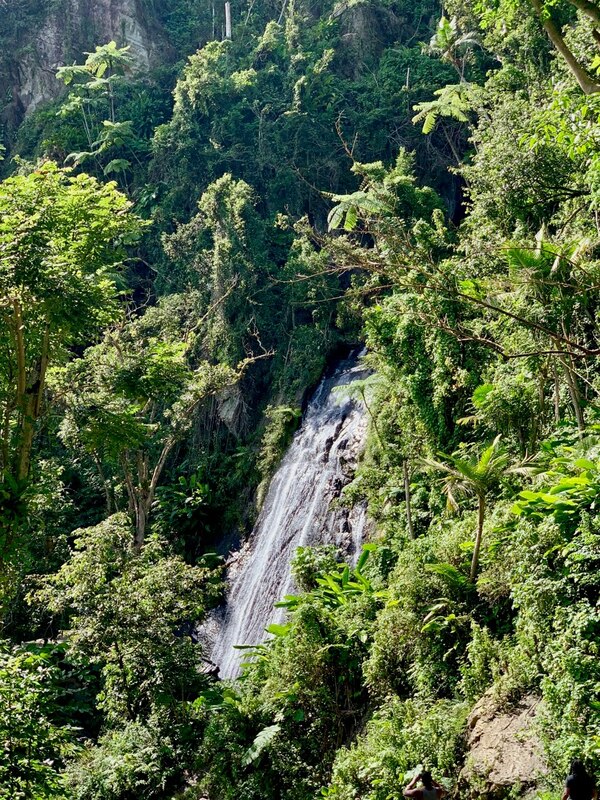 We haven't booked our excursion yet but we are debating between a couple things. They have a couple of other tours available and honestly, I would have chosen a shorter one. 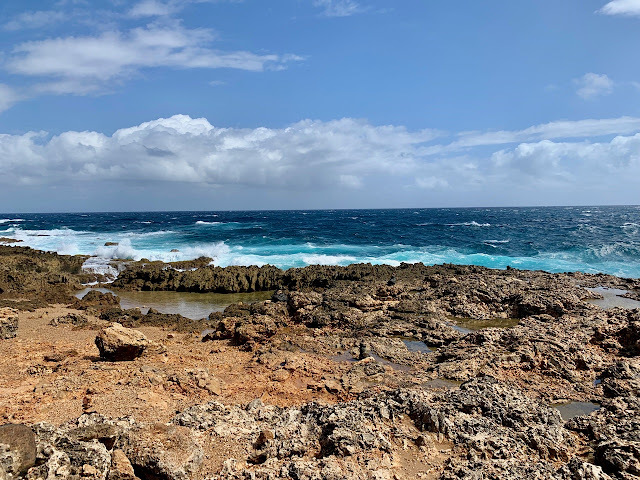 If I had it to do over, I would pick "PANORAMIC HALF ISLAND TOUR- OPTION 1" For us, it was just a little too long (coupled with the delay especially). But overall I liked the tour guide a lot and I would book with them again. I think the delay was a little poorly handled, but I think they didn't quite know what to do. Something was clearly out of the norm there. We awoke around 7:30, got ready, ate breakfast at Cabana's and disembarked at 8:45 AM for our 9:00 AM car rental pickup. We waited at the location they indicated but they did not arrive. By 9:20 I was annoyed and trying to figure out what to do. 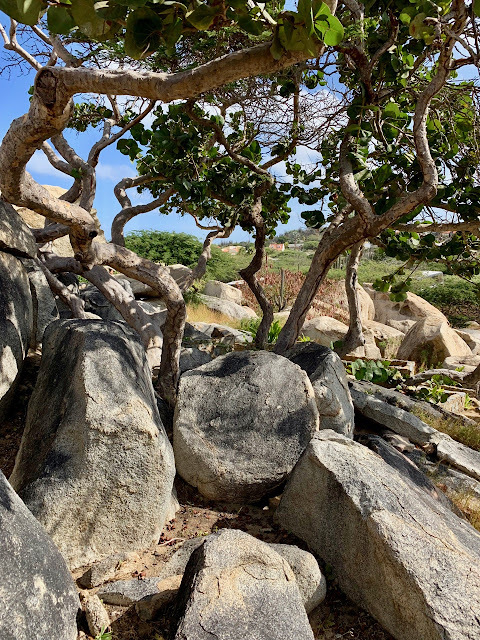 Our phones didn't work in Aruba so we couldn't call. I asked at the nearby diamond store if I could use their phone and they refused. So I went into the Harley Davidson store and they agreed. (That might say something about diamond people vs. bikers...) I called the car rental and they said that they would send someone so finally at 9:40 we were picked up and taken to the offsite car rental place. We got the car sorted out and by 10:00 AM we were on the road. I still don't know why they weren't there. I saw that they had a list of pickups on the car counter when I was filling out paperwork and it said "9 AM cruise terminal" on the list. Someone dropped the ball, I guess. Our first stop was the Casibari Rock Formations, about a 15 minute drive from the car rental place. We walked around the gravel trails looking at the incredibly huge boulders for about 20 minutes and climbed to the top of the largest pile to take in the view. We also saw some really cool bright blue lizards and Emmaline spotted a hidden Mickey rock (in profile). 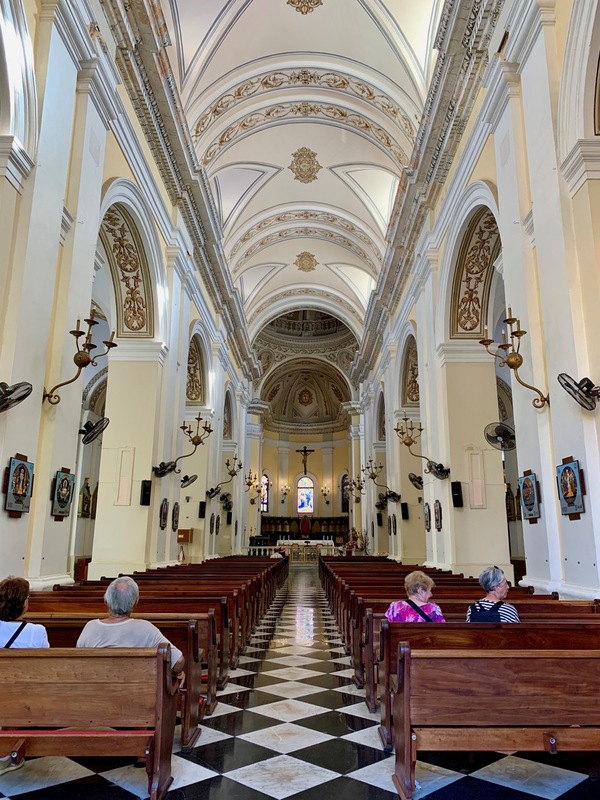 Casibari was neat, but really full of tourists. Our next stop, about 7 minutes away was another rock formation, the Ayo Rock Formation. I actually preferred this to Casibari. Ayo is perhaps less tall and impressive, but the trails snaked between some of the rocks and we went through sections that were almost like caves. 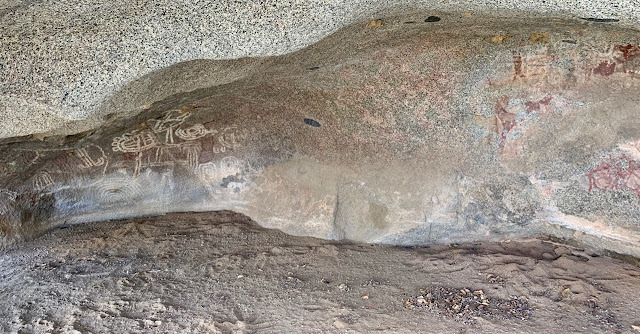 There were also fewer people at this set of rocks and we spotted some wild goats (that I couldn't get a good photo of) and some petroglyphs. 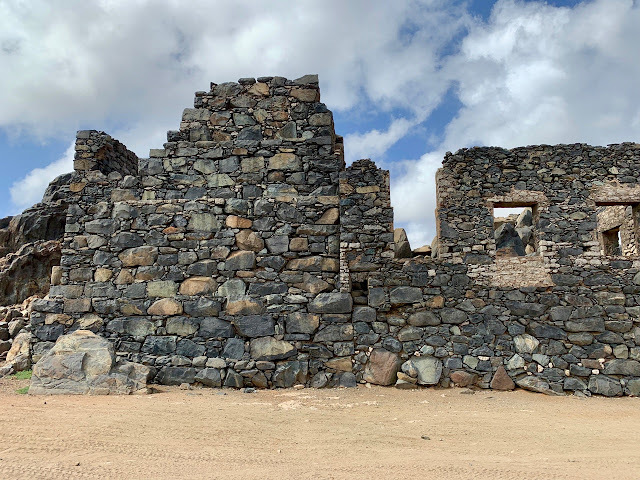 After a quick bathroom break, we jumped back into our car and drove about 5 minutes to the Bushiribana Ruins. These ruins of a former gold smelter date back to 1825 when gold was mined nearby and sit near a rough and craggy coastline on the northeast side of the island. The sea was tumultuous and the waves crashed against the rough volcanic rocks that made up the coastline. It was a beautiful, albeit windy, setting. 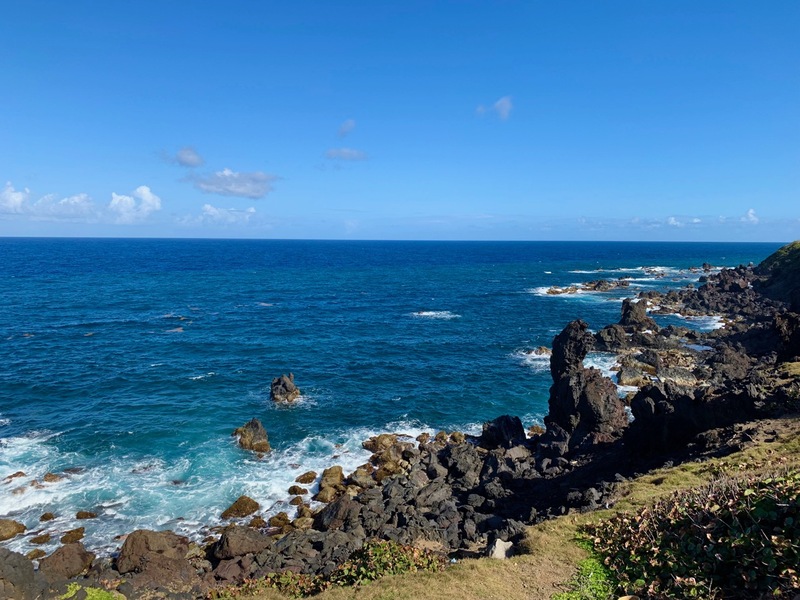 We bought some overpriced water from a food truck set up there selling snacks and beverages and got back into the car, driving along the coast about 5 minutes to the Natural Bridge. 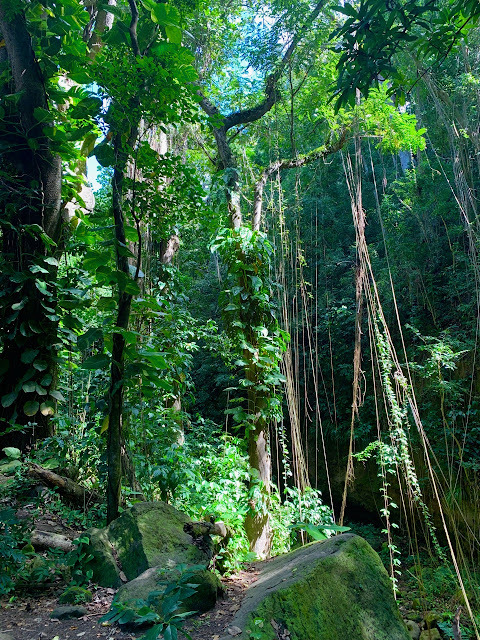 The actual "Natural Bridge" collapsed in 2005, but there is still another one there dubbed "Baby Bridge." I have to say, if this one is the baby, the other one must have been really impressive! The surf and volcanic "beach" here were also very impressive and beautiful. We stopped into a shop lot where a lady was making stroopwafels. Emmaline wanted some so we bought a bag of broken bits, which seemed easier to manage in a car. By this time it was almost noon and we were ready for lunch (well, those that didn't eat a bunch of stroopwafels) so we drove back to town and stopped in at Linda's Dutch Pancakes and had some savory and sweet Dutch pancakes. 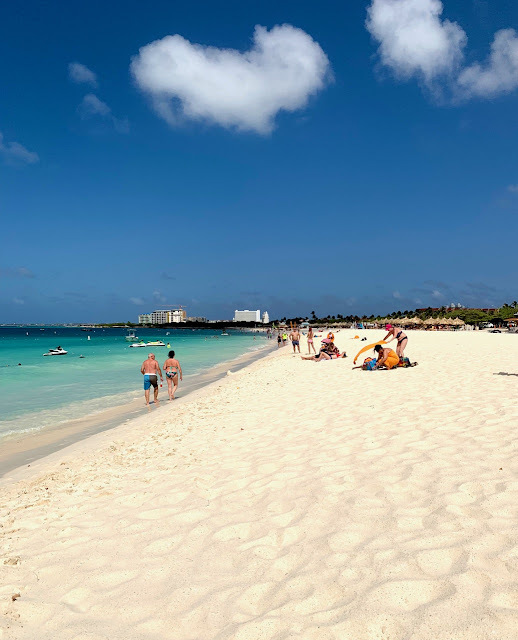 Aruba, like Curacao is also a Dutch island, however, they have some additional independence that they obtained in the 80's, though apparently they aren't fully their own nation. It sounds very complicated and I don't entirely understand it all. So we're eating Dutch pancakes which were very large and very yummy and very expensive. Roger and I could have potentially shared one, except that he's a meat eater and I'm a vegetarian and we couldn't agree. We should have asked if we could do half and half. Oh well, we're on vacation so here's to $50 worth of pancakes! We finished up there and after a brief stop for some caffeination at Starbucks, we hit the beach around 1:30 PM. We found a parking spot at Eagle beach and paid $1 each to use the bathrooms at a bar to change our clothes. 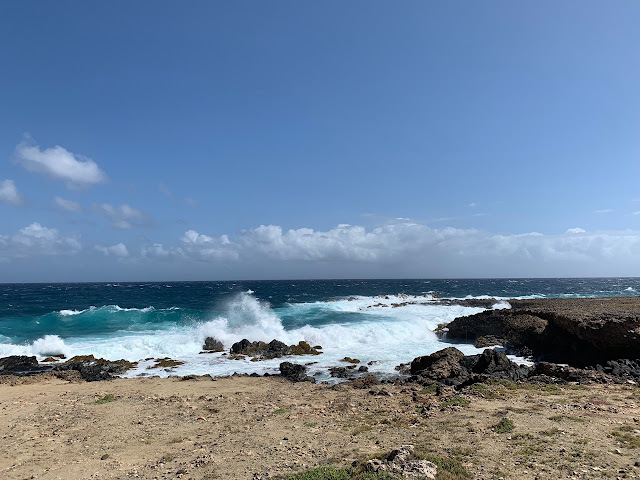 The beach was beautiful, but was extremely windy and now and then a particularly large gust would blow a stinging blast of sand at our backs or faces, which wasn't pleasant. 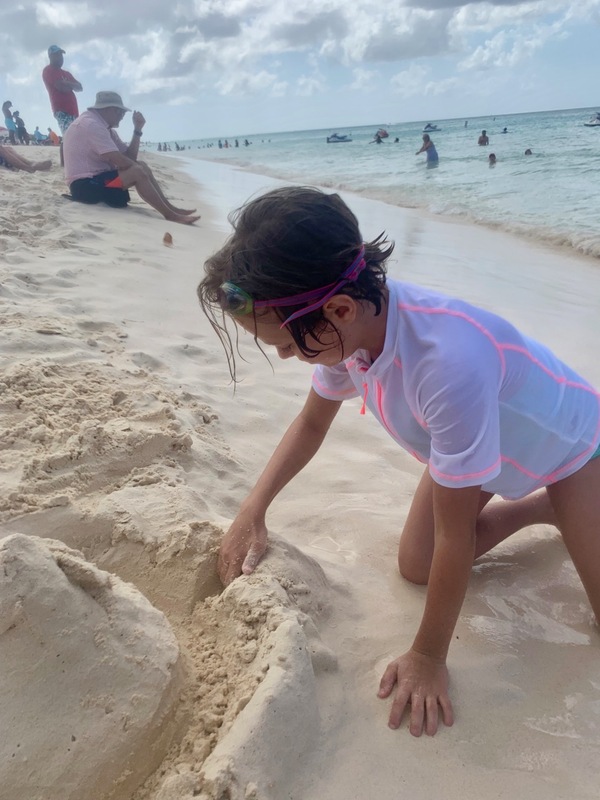 Emmaline enjoyed digging and building a sand castle and we all enjoyed the surf a bit. The beach was very busy, apparently busier than normal because they were celebrating a holiday. 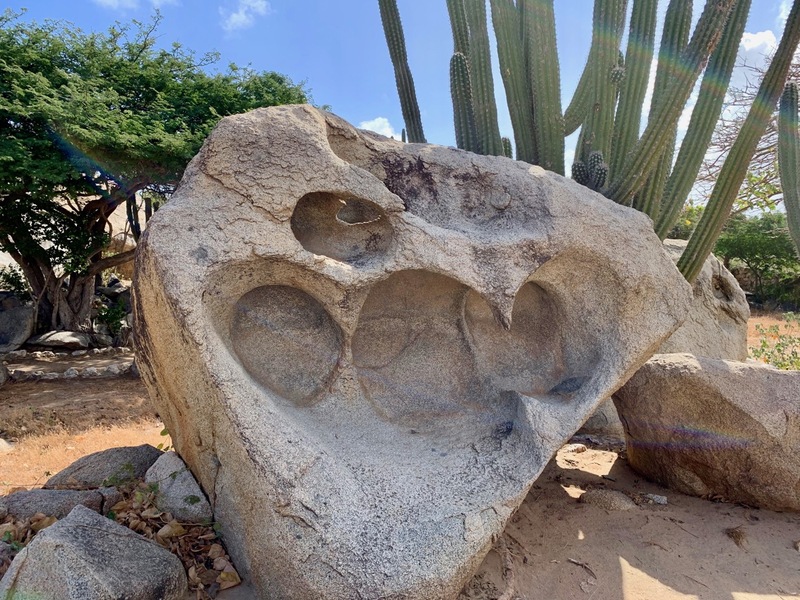 Every January 25th is Betico Croes Day, celebrating the man that helped Aruba attain their "Status Aparte" which has to do with the aforementioned not quite independent, yet independent status. I'm still confused. Anyway, loads of people were apparently off from work and they all went to the beach. 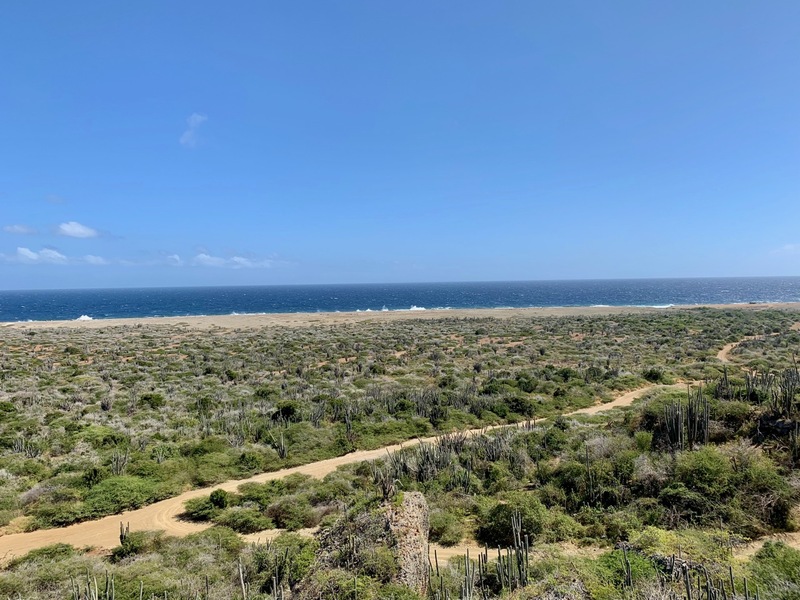 We stayed at the beach until around 3:00 PM, when we decided we'd had enough wind and sun and we packed up and returned the rental car and got a ride back to the port. Then we purchased a beautiful handmade magnet for our fridge that somehow went missing between that time and when we arrived home. It's hanging out somewhere with the Genoa magnet we got in June and met the same fate. There are probably some missing socks in the same place. Back onboard the ship around 3:45 PM, we showered, ate some snacks and Emmaline went to the club while I started to organize things and get a few things packed so I wouldn't have as much to pack on our sea day. At 6:15 PM it was time for the evening's show in the Walt Disney Theatre. This time we saw Max Winfrey who was billed as performing "physical comedy." What that actually means, apparently, is juggling. He was a good juggler and put on an entertaining show. After the show we changed into our semi-formal clothes and had some more photos taken. We ended up buying one of these. I also would have liked one of the formal night photos, but I didn't feel that we needed both and they've done away with the 10 photo package, which is annoying and the 15 photo pack is ridiculously priced. After that, it was time for dinner and we were back in Animator's Palate for the animation magic show. We all drew our little characters and they were shown up on screen parading around. I'm glad they have this show also on the Wonder now (we didn't have it last time we were on the Wonder, but we did do it on the Magic in June). It's very cute and I love to see everyone's different drawings. After dinner, the girls went off to the kids club and Roger and I went to see a comic in the adult club. Maryellen Hooper was really funny. I was almost in tears a couple of times she cracked me up so much. Most of her act was about being a mom and she dished about her husband and every day life. She was like a modern day Mrs. Maisel. By then it was late so I picked up Emmaline from the club and we all went to bed. Great trip report so far. Thanks for sharing. The last day of our vacation was another day at sea. I woke up and brought down some fruit and pastries for a light breakfast from Daisy's before Roger and I prepared to go to spin class at 9:00 AM. Emmaline opted to stay in the room in her pjs and watch the stateroom TV while we were there. Spin class was fine, but not my favorite instructor I've had on DCL. Interestingly the lady next to me was also an instructor so we chatted a little before class. After class, we went back to the room and cleaned up then we all went and had a little more light breakfast in Cabana's. We did a little packing and organizing and then Emmaline wanted to go check out the "Mickey 200" in Azure. We got there a little bit late and as it's first come first served so we didn't get a number card we needed in order to participate. However, the member of the cruise staff team running the activity remembered Emmaline from the talent show and went out of her way to pair Emmaline up with another girl of similar age who did have a number, which was really nice of her. Roger joined us in Azure and took over while I went to go get ready for our brunch in Palo. 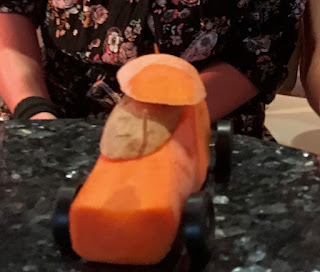 When I came back to Azure, Emmaline and her new friend had designed a race car using a potato and a truly enormous carrot. DCL had also supplied participants with four wheels and toothpicks to hold pieces together. (Adults were in charge of the carving while kids were given the task of designing.) Roger says it's like something called "Pinewood Derby." The cars were pitted against one another on a sloping track and the winner of each of four heats went on the qualify for the final round. Emmaline's team ("Mater's Pertaters" which the hosts couldn't say correctly) ended up qualifying and eventually took second place in the final round. The whole thing was a lot of fun (and also kind of ridiculous). After the babies raced, Roger and I went to Palo for our grown-ups only brunch and Emmaline went to the club with some friends (her friend from dinner as well as the one she met the first day at the meet and greet). Palo was good, but I'm going to confess, I think it wasn't as good as it was last time. We talked about it and especially now that the price has gone up, we're not sure we're going to book again. We finished in Palo and I went to find Emmaline, but she had checked out of the club. I assumed she was hungry and went to look for her on Deck 9 (because she wasn't answering her messages due to the app being glitchy) and found her in Cabana's with her friends eating lunch. After lunch, I went with her and her friends to the Promenade Lounge where they played some games and I chatted with another mom. After awhile, the girls went back to the club and I went back to the room to pack our luggage. 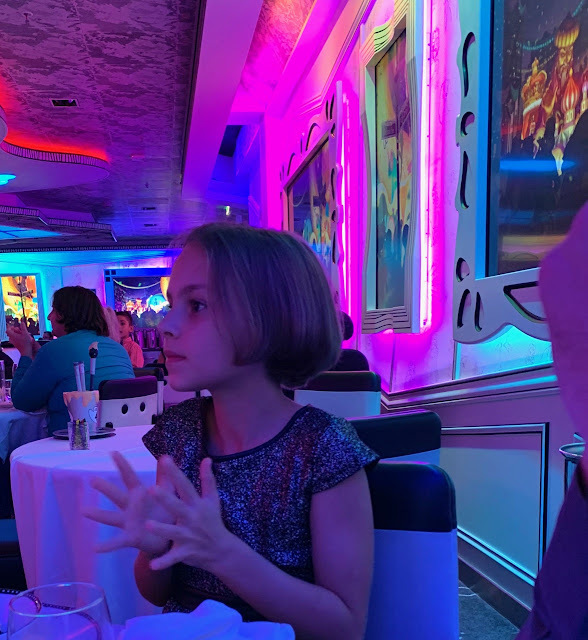 After trivia, we all went up to deck 9 for some snacks before heading back to the room to regroup before the show, "Disney Dreams." It's definitely a favorite and it didn't disappoint on this occasion. After the show, Emmaline went to go to D Lounge for "Who Wants to be a Mouseketeer?" (A game show a la "Who Wants to Be a Millionaire?") Roger and I packed and then I ran up to Shutters to select photos to purchase. Then it was time for our final dinner. I was excited for Mardi Gras night in Tiana's Place. It was a fun little show with a parade around the restaurant and everyone got beads. I confess, I thought the beignets were only okay. After dinner, we considered going to see Maryellen Hooper again, as she had another show in Azure, but we knew the morning would be coming sooner than we wanted so instead we all went back to the room, made final preparations for debarkation the next morning and went to bed. We needed to be at breakfast by 8:15 AM so Roger and I woke up around 7:15. 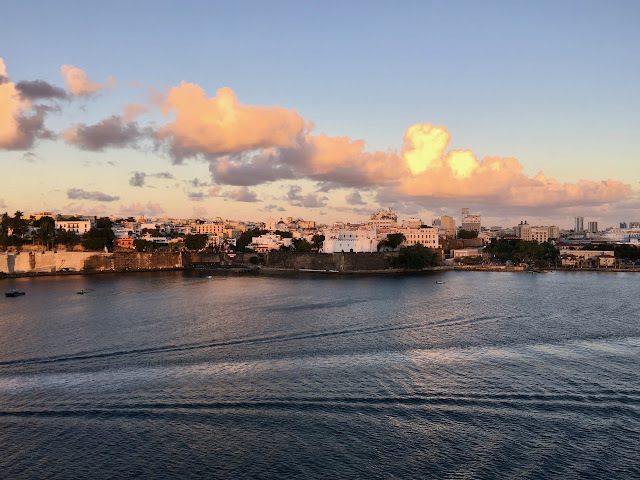 I looked out the window and we were docked back in San Juan. Sigh. I showered and we finished packing up our things and woke up Emmaline so we could get some breakfast. She was very hard to wake and in a very very bad mood. I didn't blame her but I really did need her to get out of the bed so we could get moving. Finally I got her up and dragged her to Tiana's Place where we sadly said goodbye to our serving team and table mates, exchanging contact information with the latter. 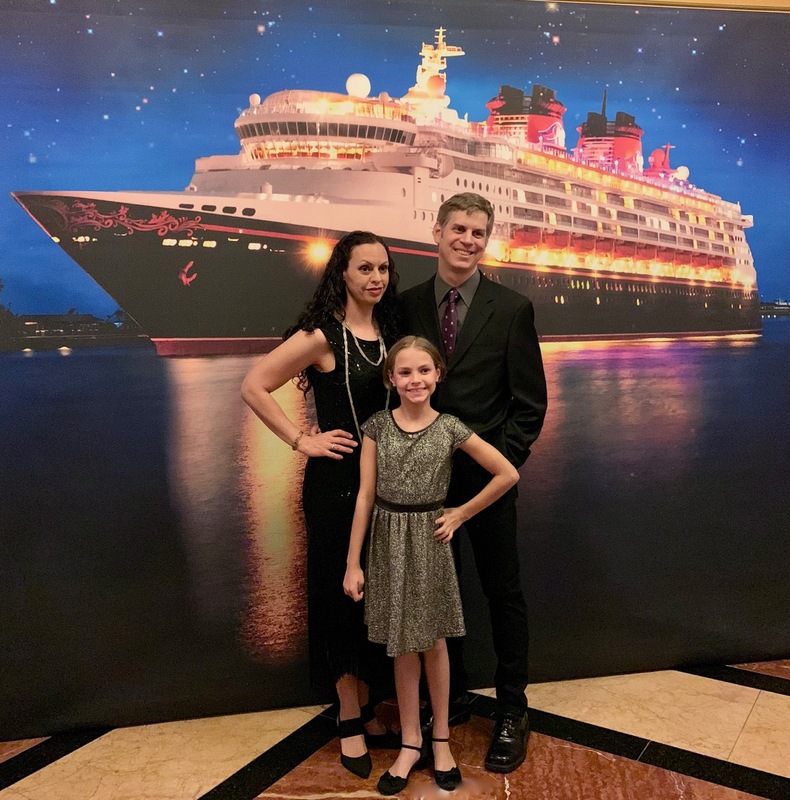 We were some of the last people to filter out of Tiana's and by the time we had used the bathrooms and said our final goodbyes at 9:30, they were starting their calls of "GET OFF THE SHIP RIGHT NOW FOR REAL!!" So we got. We found our luggage, made our way easily through customs and found end of the long long taxi line. A guy came up to us in the taxi line and asked how many people we had. I told him three and he said he would take us in a shared van to the airport right then for $25. Sold. We got into the van and Emmaline was happy to see our table mates there! She got to ride to the airport with her friend, which was nice. At the airport, our baggage had to go through a special USDA screening first before we could proceed to the checkin counter. We checked the bags and went to the gate, plenty early for our flight at noon. Our flight to Fort Lauderdale was uneventful and we grabbed some food during our layover. Unfortunately our flight from Fort Lauderdale was delayed an hour. Thankfully all our baggage made it and we were tired and sad to be off the ship, but also ready to fall into our own beds. So bittersweet. For some reason, this felt like the most difficult departure from the ship we've experienced, maybe because we were going directly to the airport. In the Mediterranean we were staying in Rome for a few days and seeing Dru. In Alaska we were spending the day exploring Vancouver and staying the night there. We had other activities to look forward to. This day we had...nothing. It was a harsh trip back to reality. Overall, it was a really great vacation. 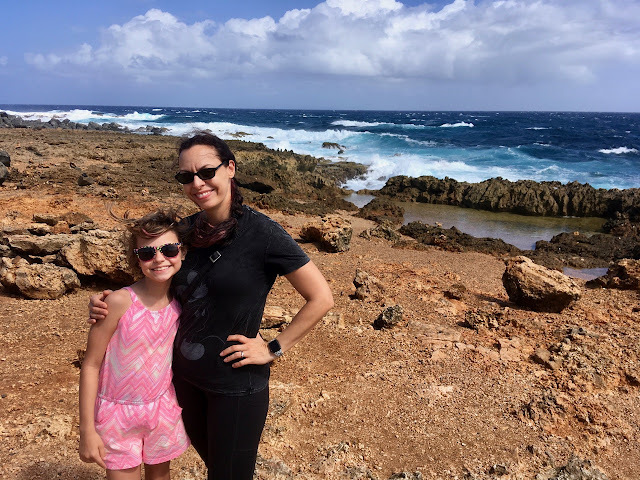 To start, we had a lot of fun in Puerto Rico and I definitely want to go back there. 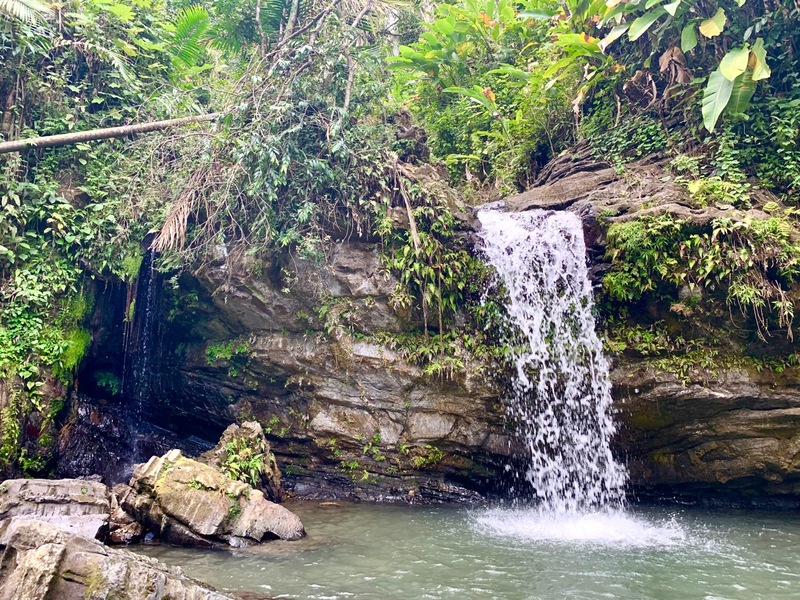 It would be great to actually go inside one (or more) of the forts there and there were other things in the rainforest we didn't do, like hike some of the longer trails and pathways. 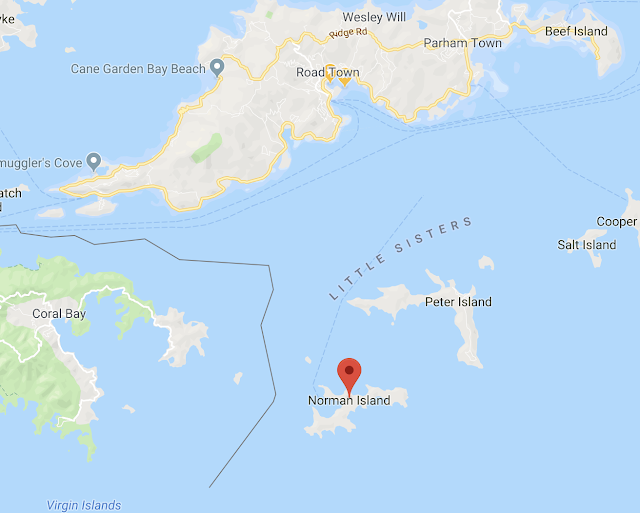 I would also like to visit one of the bioluminescent bays (we were unable to do so because there was a full moon while we were there and it's not so visible during the full moon). 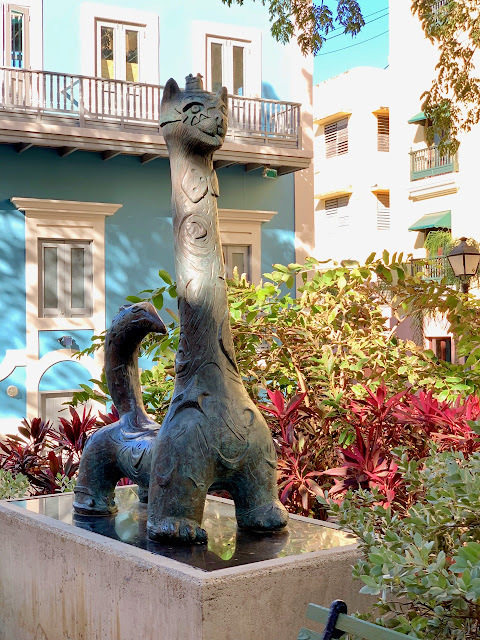 There are also some other museums and cultural things we could have seen in old San Juan that would be fun. 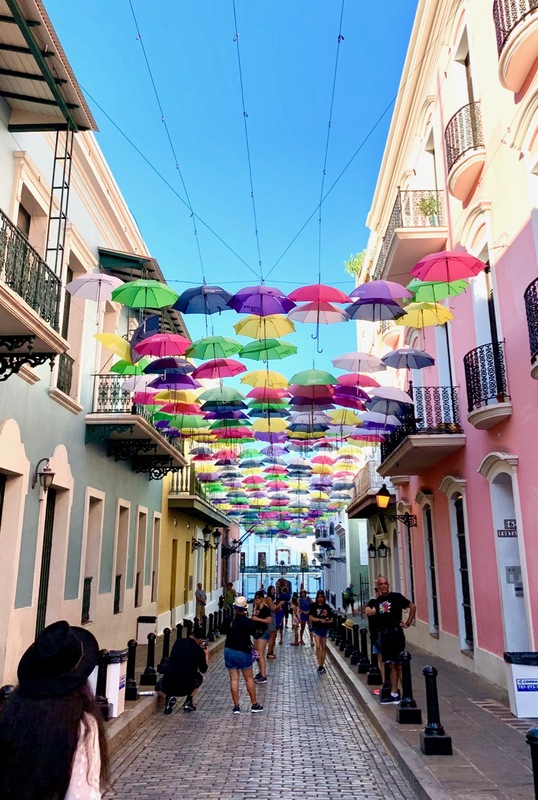 Puerto Rico definitely impressed me with it's beauty and culture, and the people were very welcoming and friendly to tourists. Though, in a conversation I had with the taxi driver on the way to the port, they feel like the US has abandoned the people there, especially in the aftermath of the hurricane. But I also got the feeling his sentiments were the same prior to the storm. He said that they have problems with education and poverty and things are hard for for the people there. I think we will definitely return to PR and another Southern Caribbean itinerary is on our radar, though with completely different port stops. Onward to new adventures! 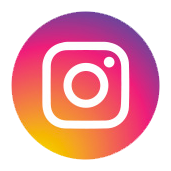 TestingH2O and Ladybugx87 like this. Palo was good, but I'm going to confess, I think it wasn't as good as it was last time. We talked about it and especially now that the price has gone up, we're not sure we're going to book again. We've got brunch booked in March and I think it will be our last for a while. It's fun but not $40 per person on top of the meal you've already paid for fun. DD is always hardest to wake on that last morning. It's like she takes the whole trip to settle in to vacation and then it's over! 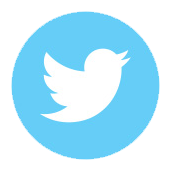 Thanks again for sharing your report. Looks like a lot of fun.